The role of mechanical signals in cell identity determination remains poorly explored in tissues. Furthermore, because mechanical stress is widespread, mechanical signals are difficult to uncouple from biochemical-based transduction pathways. Here we focus on the homeobox gene SHOOT MERISTEMLESS (STM), a master regulator and marker of meristematic identity in Arabidopsis. We found that STM expression is quantitatively correlated to curvature in the saddle-shaped boundary domain of the shoot apical meristem. As tissue folding reflects the presence of mechanical stress, we test and demonstrate that STM expression is induced after micromechanical perturbations. We also show that STM expression in the boundary domain is required for organ separation. While STM expression correlates with auxin depletion in this domain, auxin distribution and STM expression can also be uncoupled. 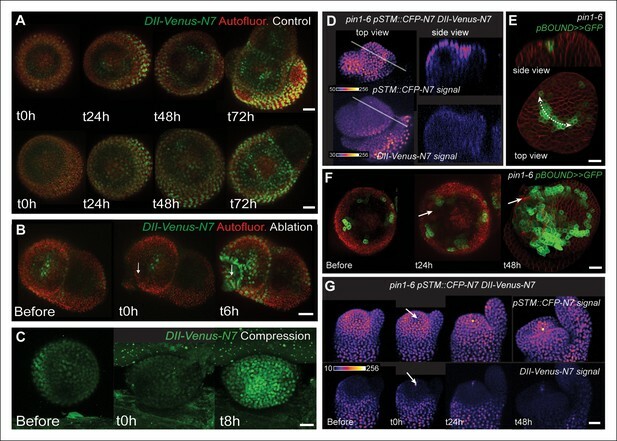 STM expression and boundary identity are thus strengthened through a synergy between auxin depletion and an auxin-independent mechanotransduction pathway at the shoot apical meristem. The bending, stretching or squashing of cells or tissues can be used as a signal to trigger a range of biological responses. However investigating the role of these mechanical signals remains a challenge. This is partly because the forces that trigger the mechanical signals are often short-lived and changeable, and partly because the signals can be difficult to separate from the biochemical responses that they generate. Stem cells present at the tip of the growing shoots in a plant are exposed to mechanical forces. These growing tips are called shoot meristems, and the stem cells they contain create all the aboveground organs of the plant (stems, leaves and flowers etc.). In each meristem, a boundary forms between the slow-growing stem cells at its centre and the fast-growing organs that form around them. Because these plant cells are both stuck together by their cell walls and growing at different rates, strong mechanical stresses are created causing this boundary to fold. A key regulator of the meristem is a protein called STM, but it remains unclear whether mechanical signals are involved in the control of this protein. To investigate this, Landrein et al. tracked where the gene for the STM protein was switch on in shoot meristems in a plant called Arabidopsis, and found that it is highly active at the boundary. Analysing STM in different mutant plants combined with advanced imaging techniques revealed that STM activity correlates with the extent of creasing at this boundary. The STM protein is also required at the boundary to ensure that developing organs separate out. These findings suggest that boundary folding might somehow create signals that activate STM. One candidate signal was the plant hormone called auxin because reduced levels of this hormone were previously associated with boundary formation. However, in further experiments, Landrein et al. ruled out auxin’s involvement in this process. So do mechanical signals activate STM at the boundary? To test this, the mechanical forces in the meristem were altered by compressing the growing shoot meristems in miniature vices and by killing a few stem cells at the meristem centre. Both of these actions triggered the production of STM in the meristem, consistent with its activity being altered by mechanical stress. Landrein et al. propose that the mechanical regulation identified acts in parallel to auxin signalling, providing robustness to the regulation of gene activity in the shoot meristem. In other words, tissue folding can guide gene expression, via the production of mechanical signals. But how shoot meristem cells respond at a molecular level to mechanical stress awaits future work. Finally, proteins related to STM can be found in all biological kingdoms, including some proteins that regulate important process in animal development. Whether the activity of these related proteins is also regulated by mechanical forces remains to be investigated. Almost 100 years ago, Thomas D’Arcy Wentworth Thompson proposed that shape of plants and animals could be described as a consequence of the laws of physics (D’Arcy Thompson, 1917). While this view has been overshadowed by the rise of molecular biology and morphogen-based patterning mechanisms, a growing contribution of mechanics in shape changes is currently emerging. In this framework, an instructing role of mechanical forces has been successfully explored theoretically (Shraiman, 2005; Aegerter-Wilmsen et al., 2007) and there is today accumulating evidence that many molecular actors involved in development are under both biochemical and mechanical control. In particular, studies on single animal cells show that mechanical forces contribute to the control of cell division and cell polarity, and relevant mechanotransduction pathways have been identified (e.g. Houk et al., 2012; Fink et al., 2011; Thery et al., 2007). The idea that mechanical stress may also play a role in defining cell identity has also emerged in the past decade (Engler et al., 2006 Aliee et al., 2012; Landsberg et al., 2009; Farge, 2003; Brunet et al., 2013). However, this pioneering work is still debated and a role of mechanical signals in cell identity during development remains an open question. Furthermore, all the currently known mechanotransduction pathways involve elements of established biochemical-based transduction pathway (e.g. Janmey et al., 2013; Jaalouk and Lammerding, 2009; Orr et al., 2006). Assuming mechanical signals play an important role in development, one may thus question the added value of mechanical signals in development if their action is so tightly coupled to biochemical signaling. Because their development is slow, iterative and does not involve cell movements, plants are systems of choice to explore the possible contribution of mechanical signals in proprioception, i.e. in channeling growth and identity from intrinsically generated mechanical stresses. Mechanical cues contribute to the emergence of lateral roots in Arabidopsis (Ditengou et al., 2008; Richter et al., 2009), the expression level of the transcription factor PtaZFP2 correlates to the amount of bending in poplar stems (Coutand et al., 2009) and the expression of the ELA1 gene in a specific cell layer of the developing seed is triggered by mechanical signals that are generated by the growth of the embryo against the endosperm (Creff et al., 2015). While these studies suggest that physical forces can contribute to cell identity definition in plants, this remains to be fully demonstrated. A fitting system for this question is the shoot apical meristem (SAM), which contains a plant stem cell niche and controls the formation and identity of all aerial organs. Because cells are glued to each other, differential growth generates mechanical conflicts leading to shape changes. For instance, tissue folding occurs in the boundary domain of the SAM between the slow growing meristem and the fast growing organ. Because the epidermis is load-bearing (Dumais and Steele, 2000; Kutschera and Niklas, 2007), the boundary domain is characterized by a highly anisotropic mechanical stress; this mechanical stress controls microtubule orientation, which in turn channels growth direction and promotes tissue folding (Burian et al., 2013; Hamant et al., 2008). A contribution of mechanical stress in the polarity of the auxin efflux carrier PIN-FORMED 1 (PIN1) was also proposed suggesting an indirect contribution of mechanical signals in auxin patterns and thus in organogenesis at the shoot apex (Heisler et al., 2010; Nakayama et al., 2012). While the genetic bases of meristem functions are now well documented, a link between these genetic regulators and mechanical signals remains to be identified in the SAM. The homeodomain transcription factor SHOOT MERISTEMLESS (STM) is a key regulator of meristem functions and its expression is often considered as the best marker of meristematic identity. In the shoot apical meristem, STM is expressed ubiquitously, with the exception of young primordia where it is down-regulated (Long et al., 1996). Interestingly, the STM promoter has previously been reported to be more active in the boundary domains of the SAM (Heisler et al., 2005; Leasure et al., 2009; Kim et al., 2003; Jurkuta et al., 2009). In line with this observation, STM expression is regulated by several boundary specific genes (Aida et al., 1999; Borghi et al., 2007; Lee et al., 2009; Takada et al., 2001), in part via auxin signaling (Aida et al., 2002; Treml et al., 2005). Because the boundary domain is also a site under mechanical stress, we investigated whether such stresses could act as signals to control STM expression at the shoot apical meristem. Because it is easily accessible, we focus our analysis on the shoot apical meristem (SAM) at inflorescence stage; the generated organs are thus floral meristems. We generated a transcriptional fusion pSTM::CFP-N7 with the 5,7 kb region upstream of the STM gene (AT1G62360) and observed the presence of an enhanced STM promoter activity in the SAM boundaries, as previously shown (Heisler et al., 2005; Leasure et al., 2009; Kim et al., 2003; Jurkuta et al., 2009), n > 20, Figure 1A). To further confirm this result, which was obtained in dissected meristems from greenhouse-grown plants, we also analyzed the CFP signal in meristems from NPA-treated in vitro grown seedlings. In these conditions, polar auxin transport is inhibited and naked meristems are generated (Grandjean et al., 2004). When plants were taken off the drug and started to initiate new organs, higher CFP signal was observed specifically in the boundary domain (Figure 1—figure supplement 1). Correlation between pSTM::CFP-N7 expression level and tissue folding at the boundary. (A) pSTM::CFP-N7 expression pattern in the SAM. Membranes are labeled with FM4-64 (white, lower panel) and pSTM::CFP-N7 expression is shown using the Fire lookup table in ImageJ (upper panel, n > 20). (B) Longitudinal optical sections (5 μm thick maximal projection of orthogonal views) through the middle of five successive boundaries of a representative meristem expressing pSTM::CFP-N7. Note the increase of pSTM::CFP-N7 signal intensity in the boundary as the crease between organ and meristem becomes deeper. (C) Close-ups showing a correlation between pSTM::CFP-N7 signal intensity (upper panels) and Gaussian curvature (lower panels, see Material and methods) in three successive boundaries of the meristem presented in A. (D and E) Quantification of the correlation between pSTM::CFP-N7 signal intensity (upper panel) and Gaussian curvature (lower panel) in the meristem presented in A (see Material and methods). (D) The white outline encloses the cells that are used for the graph presented in E. (E) pSTM::CFP-N7 signal intensity is plotted against Gaussian curvature. Values are compared using a bilateral Student test. The same correlation was observed in 5 independent meristems. Scale bars, 20 µm. When performing live-imaging of the meristem expressing pSTM::CFP-N7, we found a correlation between STM promoter activity in the boundaries and the progressive formation of a crease in this domain, at least qualitatively (Figure 1B). To assess this quantitatively, we measured the Gaussian curvature of the boundary at different stages of development in parallel with CFP signal intensity. Existing quantification protocols were not adequate: the replica method for instance involves the application of dental resin to make a cast of the meristem (e.g. Kwiatkowska and Dumais, 2003) and this may impact gene expression; the image analysis software MorphoGraphX could provide a mesh surface together with gene expression levels, but some errors in the most curvy parts of the meristem could not be avoided. We thus implemented the level set method (Sethian, 1999) in Python to detect the exact surface of the meristem: a suitable surface obtained by the thresholding of the image is evolved to the smooth surface that is the most accurate representation of the surface contrast in the 3D images. Second, MorphoGraphX was used to mesh the surface (Kierzkowski et al., 2012), and to compute the Gaussian curvature taking into account neighborhoods within a 15 μm radius (Figures 1C and Figure 1—figure supplement 2). Using this pipeline, a negative correlation between CFP signal intensity and Gaussian curvature could be revealed and quantified (Figure 1C–E, Figure 1—figure supplement 2). As a negative control, and using the same pipeline, no clear correlation between Gaussian curvature and CFP signal could be observed in a line expressing a transcriptional fusion pPDF1::CFP-N7 that exhibits a relatively homogeneous signal in the whole meristem epidermis (Figure 1—figure supplement 3). To test this correlation further, we also analyzed the expression pattern of STM in the pSTM::ALcR AlcA::GFP line (named hereafter pBOUND>>GFP) which contains 4.4 kb sequence upstream of the STM gene and has already been described previously (Laufs et al., 2004). In this line, expression is restricted to boundaries, thus confirming the correlation between the GFP signal intensity and the extent of curvature at the boundary at least qualitatively (n > 20, Figure 2A). The correlation could also be observed in meristems from NPA-grown seedlings (Figure 2—figure supplement 1). In this line, the signal was so clear-cut, that the total area of GFP expressing cells on longitudinal sections could be qualitatively correlated with the formation of a crease (Figure 2B). To quantify this, we generated optical longitudinal section through the middle of each emerging primordia, measured the surface area of expression of pBOUND>>GFP in these sections and plotted it against the angle of tissue folding at the same position (see Material and methods). As in the pSTM::CFP-N7 line, we measured a strong correlation between the area of pBOUND>>GFP expression and the angle of boundary folding measured on the orthogonal sections (n = 154, 5 SAMs observed at 5 time points over 48 hr, Figure 2D). A similar correlation could be measured in another independent live-imaging experiment (Figure 2—figure supplement 2, n = 193, 5 SAMs observed at 6 time points over 39 h). Correlation between pBOUND>>GFP expression level and tissue folding at the boundary in WT and bot1-7. (A) pBOUND>>GFP expression pattern in WT (ecotype WS-4) and bot1-7 meristems. Membranes are labeled with FM4-64 (white) and pBOUND>>GFP expression is shown using the Fire lookup table in ImageJ. (B) Longitudinal sections through the middle of successive boundaries of the meristems presented in A (2 μm thick maximal projection of orthogonal views). Organ size (surface area as viewed from the top) is written in red for each stage. 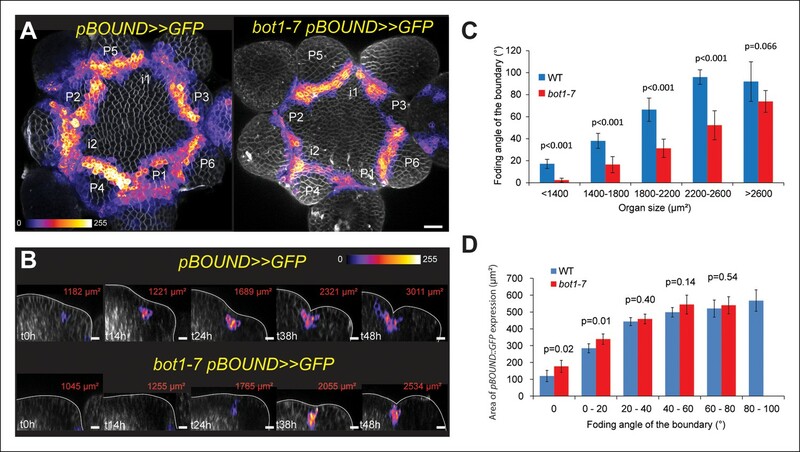 Note the delay in tissue folding and GFP signal expression in bot1-7 when compared to the WT. The white line marks the outer surface of the SAM. (C) Quantification of the delay in curvature at the boundary in bot1-7: Folding angle is measured on orthogonal views and organ size is estimated from the measurement of surface area on top views. (D) The correlation between the folding angle of the boundary and the area of pBOUND>>GFP expression is maintained in bot1-7 (both parameters are measured on orthogonal sections; WT: n = 130 from 5 SAM followed during a time lapse of 5 time points during 48 h, bot1-7: n = 79 from 3 SAM followed during a time lapse of 5 time points during 48 h). Values are displayed with a Student confidence interval (α = 0.05) and compared using a bilateral Student test. Scale bars: 20 µm. To test the strength of the correlation between STM promoter activity and meristem shape, we next analyzed STM promoter activity in the katanin mutant allele bot1-7 in which the presence of disorganized microtubules leads to the formation of a shallow crease at the boundary (Uyttewaal et al., 2012; Bichet et al., 2001). We reasoned that if STM promoter activity is truly correlated with curvature at the boundary, we should still be able to detect such correlation in the bot1-7 mutant background, although with a delay in time. First, we measured the folding angle with respect to organ size in bot1-7. As expected, we observed a reduction in folding angle for a given primordium size in bot1-7 when compared to the WT, demonstrating that the relation between tissue folding and organ emergence is impaired in bot1-7: large organs still have shallow boundaries (Figure 2A,B,C). Next, we measured the GFP signal area in the boundaries of the bot1-7 pBOUND>>GFP line as described above. Note that both bot1-7 and pBOUND>>GFP are in the WS-4 ecotype, allowing comparison between mutant and WT backgrounds. Whereas pBOUND>>GFP expression area was still correlated to tissue folding, we also observed a reduction in the area of GFP expression for a given primordium stage, when compared to the WT indicating a delay in pBOUND>>GFP appearance in bot1-7 (Figure 2D, WT: n = 154 measured on 5 meristems at 5 time points; bot1-7: n = 79 measured on 4 meristems at 5 time points). Therefore, modifying the shape of the SAM in bot1-7 did not abolish the correlation between STM promoter activity and curvature, and instead demonstrated that STM promoter activity scales to Gaussian curvature values even when the relation between organ size and boundary shape is affected. Based on these results, STM promoter activity can thus be considered as a read-out of the extent of folding in the boundary of the SAM. Even though we find a correlation between STM expression and tissue folding, it is not clear whether STM promoter activity at the boundary using a reporter line truly recapitulates STM expression in the SAM. To check this, we first crossed the strong stm mutant allele stm-dgh6 (Aida et al., 2002) with a previously described pSTM::STM-Venus line, whose expression is enhanced in boundaries, as observed in our transcriptional marker lines (Heisler et al., 2005; Besnard et al., 2014; Figure 3A). The stm-dgh6 mutant exhibits the typical stm phenotype with two partly fused cotyledons, at an angle divergent from 180°, and a development arrest. At the same stage, the WT can exhibit up to 8 leaves while the stm-dgh6 only displays two old cotyledons (Figure 3B). As observed in other strong stm alleles, stm-dgh6 was able in rare cases to reinitiate organogenesis and generate a lot of vegetative tissues. In our growth conditions, we found that roughly 1out of 30 stm-dgh6 plants managed to grow beyond the cotyledon stage: these plants generated many whorled leaves and a few sterile flowers (Figure 3C). To test whether pSTM::STM-Venus can complement the stm-dgh6 phenotype, we selected 96 plants homozygous for the pSTM::STM-Venus construct and segregating the stm-dgh6 mutation. After genotyping for the presence of the stm-dgh6 mutation, we could not distinguish the WT, stm-dgh6 heterozygotes and stm-dgh6 homozygote plants visually, confirming that pSTM::STM-Venus can fully complement the mutation (Figure 3D-F, Figure 3—figure supplement 1). Importantly, we checked that STM-Venus was expressed in the stm-dgh6 homozygote background by confocal microscopy. We found that the signal was comparable to that of pSTM::STM-Venus in a WT background, notably with an enhanced signal in boundaries (Figure 3G). In a few plants, we also observed larger stems and meristems, suggesting that pSTM::STM-Venus expression level might be slightly higher than that of the endogenous gene. These results demonstrate that higher STM promoter activity at the boundary in the marker lines reflects the endogenous STM expression pattern. Based on these data, and to ease the reading for the rest of the paper, we will use the wording 'STM expression' when analyzing the fluorescent signal in STM transcriptional reporter lines. Organ separation requires STM expression at the boundary. 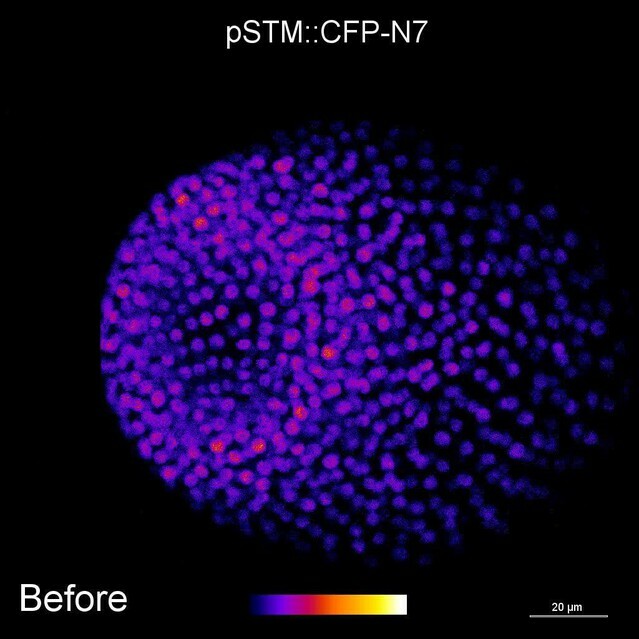 (A) Representative expression pattern of the translational fusion pSTM::STM-Venus in a FM4-64 stained meristem showing an increased signal intensity in boundaries. Scale bar, 20 μm. (B–F) The translational fusion pSTM::STM-Venus partially rescues the phenotype of the strong mutant allele stm-dgh6 (n = 5). (B) Phenotype of 3-week-old WT and stm-dgh6 plants. Note the absence of postembryonic organs in the mutant. Scale bars, 1 cm. Aerial phenotype of 2-month old stm-dgh6 plants. Scale bar, 1 cm. (D) Representative stm-dgh6 pSTM::STM-Venus plant. Scale bar, 1 cm. (E) Representative stm-dgh6 pSTM::STM-Venus inflorescence. Scale bar, 1 cm. (F) Representative stm-dgh6 pSTM::STM-Venus rosette. Scale bar, 1 cm. (G) Representative expression pattern of the translational fusion pSTM::STM-Venus in a stm-dgh6 (-/-) meristem showing a similar expression pattern as in the WT. Scale bar, 20 μm. (H, I) Homogeneous expression pattern of the translational fusion pSTM::STM-Venus in two independent pSTM::STMamiRNA lines. Scale bar (microscopy), 20 μm. Scale bar (whole plant), 1 cm. (J) FM4-64 stained WT meristem (ecotype Col-0), Gaussian curvature extracted using the level set method and MorphoGraphX, Scale bar (microscopy), 20 μm. Scale bar (inflorescences), 1 cm. (K) FM4-64 stained pSTM::STMamiRNA pSTM::STM-Venus meristem, Gaussian curvature extracted using the level set method and MorphoGraphX. Scale bar, 20 μm. Boundaries do not scale to the reduced meristem size; inflorescence phenotype with fusion events. Scale bar, 1 cm. To further confirm the biological relevance of higher STM promoter activity at the boundary, we next attempted to down-regulate STM expression at the boundary. Genetic evidence suggests that, in addition to its role in meristem maintenance, STM also contributes to organ separation in the meristem, in conjunction with other boundary expressed genes, such as CUC, KNAT6, JLO and LOF genes (Lee et al., 2009; Aida et al., 2002; Belles-Boix et al., 2006; Spinelli et al., 2011; Borghi et al., 2007; Aida et al., 1999). Lack of STM activity can generate organ fusions (e.g. 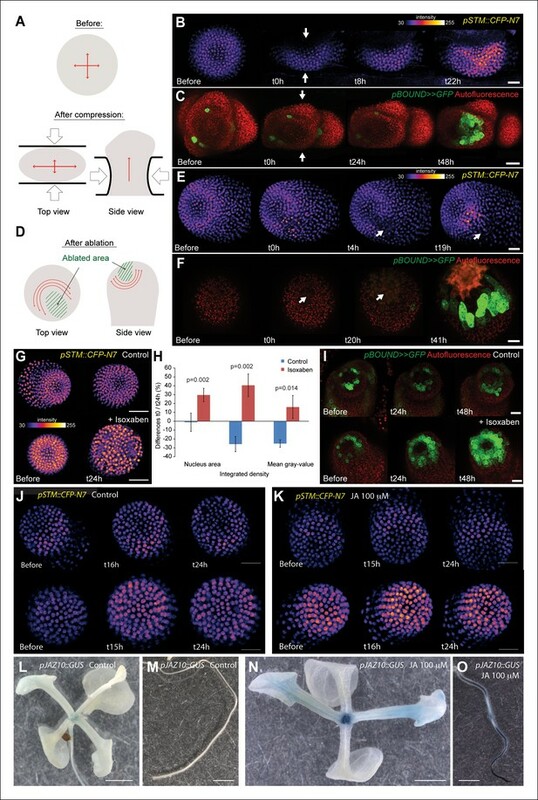 Endrizzi et al., 1996) and can enhance the fusion phenotype of cuc1 and cuc2 mutant seedlings, revealing a role of STM in boundary formation during the early stages of embryo development (Aida et al., 1999; 2002). This function also involves the STM paralog KNAT6 gene, which is expressed in the boundary domain of the meristem in embryos (Belles-Boix et al., 2006). Based on this literature, the expression of STM at the boundary is generally thought to control organ separation, but this has not been formally demonstrated. To address this hypothesis, we generated lines expressing an artificial microRNA (amiRNA) against STM under the control of the STM promoter. In these lines, STM expression level was not always negatively correlated to STM amiRNA expression level; yet, STM expression was down-regulated in all the lines we analyzed showing that this amiRNA can effectively inactivate STM to some extent (Figure 3—figure supplement 2). Given the expression pattern in the STM transcriptional marker lines, we reasoned that in these lines, we should primarily inactivate STM in the boundaries and to a lesser extent in the rest of the meristem. To test whether the amiRNA was effective at downregulating STM mRNA accumulation in boundaries, we introgressed the pSTM::STMamiRNA in the pSTM::STM-Venus lines. As expected, the STM-Venus signal was slightly (Figure 3H) or more strongly reduced (Figure 3I) at the boundary, leading to a homogeneous STM-Venus signal in the meristem. Although meristem size was affected in these lines (Figure 3J and K), meristem termination defects were rare when compared to stm mutants. In particular, many normal and fertile flowers were generated (Figure 3K). We also observed that Gaussian curvature in the boundaries did not scale to meristem size (Figure 3K). Strikingly, major fusion defects were observed in most of the lines we generated, thus showing that organ separation was impaired in these lines (Figure 3K). The presence of wide boundaries (relative to meristem size) together with a reduction in meristem size that brings adjacent boundaries next to one another, may cause such fusion events. Because the fusions are revealed much later in development, we cannot completely exclude other scenarios. Note that STM mRNA, protein or amiRNA can move between non-boundary cells and boundary cells. Yet, as a negative impact of the amiRNA on STM-Venus signal could be detected at the boundary, these data rather confirm that STM expression at the boundary has functional implications and further support its role in organ separation. The fact that STM expression correlates with curvature at the boundary can simply be explained by the fact that STM reduces the growth rate at the boundary, leading to tissue folding. KNOX genes can cause alterations in curvature in otherwise smooth surface (Long and Barton, 1998; Barkoulas et al., 2008). The impact of STM on crease formation at the boundary could be mediated by inhibiting cell growth in this domain. Consistent with this scenario, KNOX target genes include genes involved in auxin transport as well as genes involved in cell wall synthesis (Bolduc et al., 2012). Given the strong correlation between STM promoter activity and tissue folding, we investigated whether a signal related to curvature could add robustness to the STM expression pattern at the boundary. The plant hormone auxin could play such a role. A local auxin peak is one of the earliest marker of organ initiation, and conversely auxin depletion is an early marker of the boundary domain (de Reuille et al., 2006; Reinhardt et al., 2003; Heisler et al., 2005). As auxin keeps accumulating in the organ, outgrowth goes on and curvature at the boundary increases. Interestingly, auxin and KNOX proteins are known to act antagonistically. Disrupting auxin transport with NPA or in pin1 and pid mutant enhances class I KNOX gene expression (Scanlon, 2003; Furutani et al., 2004). Conversely, KNAT1 inactivation can partially rescue the leaf number defects in pin1, suggesting that the auxin signaling pathway also promotes organ emergence by repressing the expression of KNOX genes (Hay et al., 2006). In the boundary, the PIN1-dependent auxin minimum was also shown to promote axillary meristem formation whereas ectopic auxin production in the boundary inhibits axillary meristem formation (Wang et al., 2014). This is further consolidated by the analysis of the DII-Venus auxin sensor, which is degraded in the presence of auxin and exhibits a strong signal at the boundary (Brunoud et al., 2012; Vernoux et al., 2011). Consistent with the characteristic localization of PIN1 transporters around the boundary (Figure 4—figure supplement 1; Heisler et al., 2005), we also observed that a higher DII-Venus signal in the boundaries correlates with an increase in pSTM::CFP-N7 expression (Figure 4A). Interestingly, while this correlation could also be observed on longitudinal sections through the boundary as it folds (Figure 4B), we also found that this correlation is stronger in the L1 layer: In the L2 layer, pSTM::CFP-N7 expression increased during crease formation, but this was not always correlated with an increase in DII-Venus signal (Figure 4B). The DII-Venus and pSTM::CFP-N7 signals largely overlap and can be uncoupled. 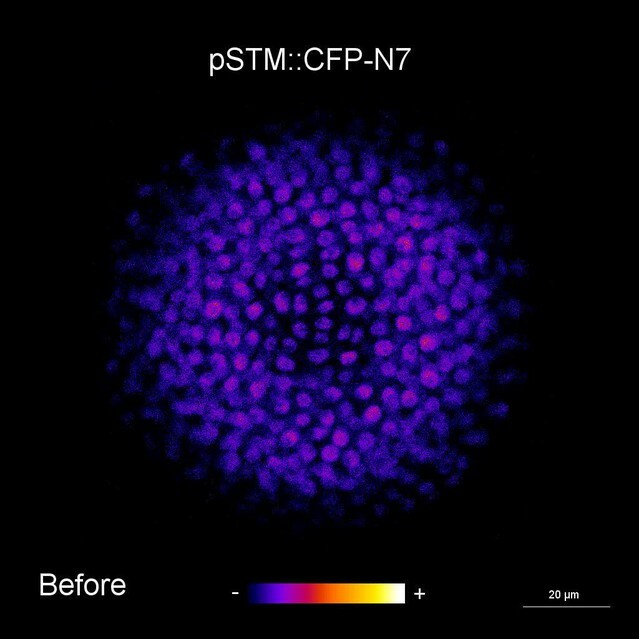 (A) Projection of a representative meristem expressing both pSTM::CFP-N7 and DII-Venus-N7 and stained with FM4-64: both signals are induced in the boundary. (B) Orthogonal sections through the middle of the boundaries of the successive primordia of the SAM presented in showing an overlap of both signals, except in the L2 layer. (C, D) Overnight treatment with 10 μM of synthetic auxin 2,4-D on dissected meristems: (C) no effect on pSTM-CFP expression after 2,4-D application (Control: n = 3, 2-4D treatment: n = 3). White arrows point at new CFP signals in boundaries (C and D); (D) total degradation of DII-Venus after 2,4-D application (Control: n = 11, 2-4D treatment: n = 12). Scale bars, 20 µm. So far, our data are thus consistent with a scenario in which a local depletion of auxin leads to the initial induction of STM expression at the boundary. If this scenario were true, the application of exogenous auxin should thus inhibit STM expression at the boundary. To test this hypothesis, we applied the synthetic auxin 2,4-D onto the meristem and observed the expression of STM. As expected, DII-Venus levels were dramatically decreased in these conditions ([Brunoud et al., 2012]; Figure 4D), confirming that auxin could indeed diffuse into the meristem. In the same conditions, STM expression at the boundary was however either unchanged or even slightly increased (Figure 4C). This suggests that, whereas auxin levels negatively correlate with STM expression in the meristem, this correlation is also dispensable: STM expression and auxin depletion can be uncoupled at the boundary. This also shows that the relation between auxin and STM expression is more complex. Next we investigated whether the involvement of mechanical signals in STM expression at the boundary could help clarify these discrepancies. There is growing evidence that mechanical stresses act as instructive signals in parallel to biochemical signals in development. These stresses have notably been involved in the progression of gastrulation in Drosophila embryos (e.g. Farge, 2003; Lecuit and Lenne, 2007) or in the formation of leaves with ruffled edges (Audoly and Boudaoud, 2003; Nath et al., 2003). In the meristem, the boundary separates a fast growing organ from the slow growing meristem. Mechanical stresses thus emerge early on from differential growth in the boundary and have been shown to act as instructive signals controlling the behavior of cortical microtubules and PIN1 early on. In turn, this promotes tissue folding that further reinforces the stress pattern at the boundary (Hamant et al., 2008; Heisler et al., 2010). We thus explored a scenario in which mechanical stress may be sufficient to induce and reinforce STM expression at the boundary. To do so, we investigated whether mechanical perturbations can trigger STM expression. Note that mechanical perturbations can be of different nature. Mechanical perturbations induced by wind or touch, are extrinsic and discontinuous; they cause short-term elastic deformations (e.g. transient bending). They can impact gene expression within minutes and induce major developmental responses such as stem thickening, when repeated (Braam and Davis, 1990). In the context of meristem growth, mechanical (tensile) stresses are in contrast intrinsic and continuous, and they cause long-term plastic responses (growth). The origin of such growth-related stresses lies in the presence of high turgor pressure rather than external stimuli. The opposition between these two kind of stresses can be illustrated with the microtubule response: transient pinching does not lead to supracellular microtubule alignments in the meristem, and this has even served as a negative control for the microtubule response to ablations in this tissue (Hamant et al., 2008). Nonetheless we cannot exclude the possibility that some elements of the mechanotransduction pathways are shared between these two types of mechanical signals. Here, given our correlation between STM expression and crease formation at the boundary, we designed our mechanical tests to check whether STM expression can be modified by continuous mechanical perturbations. First, we modified the mechanical stress pattern in the SAM using compressions or ablations and we followed the impact on the pSTM::CFP-N7 and pBOUND>>GFP expression patterns. Note that in all these experiments, we used in vitro-grown plants with a naked meristem recovering from a NPA treatment, as plants from the greenhouse need to be dissected to access the SAM, and the wounds may interfere with the mechanical perturbations. Using a microvice, we first induced global compression of the SAM. This is predicted to increase tension in the epidermis, and in the most extreme cases, to induce a bias in maximal stress direction parallel to the blades (Figure 5A, [Hamant et al., 2008; Uyttewaal et al., 2012]). Around 8 h after compression, we detected an increase of pSTM::CFP-N7 signal (n = 8; Figure 5B and Video 1). Similar induction was observed in the pBOUND>>GFP line; although the GFP signal was more variable before compression, a strong induction could nevertheless be observed in the pBOUND>>GFP line after compression (n = 11; Figure 5C and Video 2). Furthermore, even if the induction of STM expression occurred earlier in the pSTM::CFP-N7 line than in the pBOUND>>GFP line (Figure 5B and C), the overall time frame (8 h onwards) rather suggests an indirect effect of compressions on STM expression. STM expression can be induced by mechanical perturbations. (A to C) Global compression of meristems with a microvice lead to an increase in STM expression (arrows indicate the direction of the compression). (A) Predicted impact of compression on the mechanical stress pattern. (B) pSTM::CFP-N7 signal before and after compression in a representative meristem (n = 8). (C) pBOUND>>GFP signal before and after compression in a representative meristem (n = 11, red dots correspond to plast auto-fluorescence). (D to F) Ablation of a small number of cells leads to an increase in STM expression (white arrows indicate the site of ablation). (D) Predicted impact of a local ablation on the mechanical stress pattern. (E) pSTM::CFP-N7 signal before and after ablation with a needle (n > 30). (F) pBOUND>>GFP signal before and after ablation using a pulsed UV laser (n > 12, red dots correspond to plast auto-fluorescence). (G and H) Isoxaben treatment leads to an increase of pSTM::CFP-N7 signal. (G) Representative pSTM::CFP-N7 signal after overnight immersion in water with DMSO (upper panel) or in 10 μM isoxaben (lower panel). Note the increased nucleus size after isoxaben treatment, consistent with increased endoreduplication levels. (H) Quantifications: CFP signal intensity in 10 nuclei from the central zone of 6 isoxaben-treated meristems and 7 water-treated meristems. Values are displayed with a Student confidence interval (α = 0.05) and compared using a bilateral Student test. 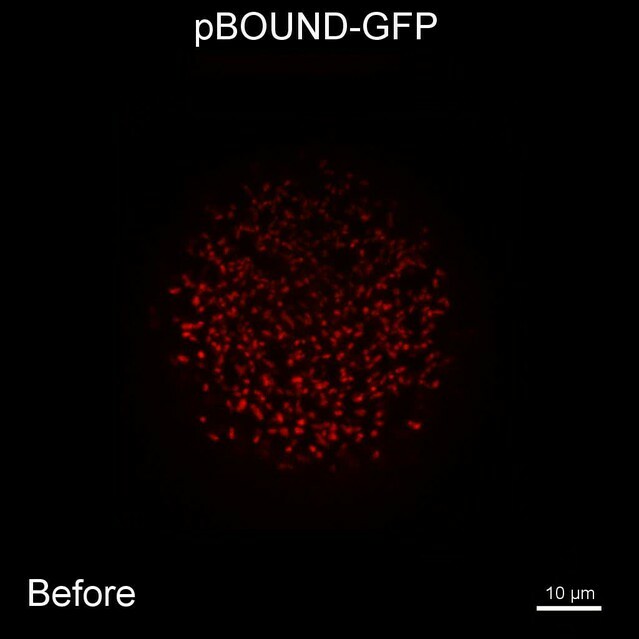 (I) Isoxaben treatment leads to an increase in pBOUND>>GFP signal (red dots correspond to plast auto-fluorescence). (I, left) Representative pBOUND>>GFP signal after overnight immersion in water (n = 10). (I, right) Representative pBOUND>>GFP signal after overnight immersion in 5 to 20 μM isoxaben (n = 20). Scale bars, 20 µm. (J, K) Jasmonate does not enhance STM promoter activity (J) pSTM::CFP-N7 signal after prolonged incubation in water supplemented with 1/1000 V/V ethanol. (K) pSTM::CFP-N7 signal after prolonged incubation in water supplemented with 100 µM jasmonate diluted in ethanol (1/1000 V/V). Scale bars, 20 µm. (L-O) Jasmonate enhances pJAZ10 promoter activity. (L, M) Aerial part (L) and root (M) of 3 week old NPA grown seedlings. pJAZ10::GUS staining after overnight incubation in water supplemented with 1/1000 V/V ethanol (n = 8). (N,O) Aerial part (N) and root (O) of 3 week old NPA grown seedlings. pJAZ10::GUS staining after overnight incubation in water supplemented with 100 µM jasmonate diluted in ethanol (1/1000 V/V) (n = 14). Scale bars, 0.5 cm. pSTM::CFP-N7 after compression (relates to Figure 5B). pBOUND>>GFP after compression (relates to Figure 5C). To check whether STM can also be induced after a more local mechanical perturbation, we next performed ablations of a few cells in the meristem to induce high circumferential stress around the site of ablation (Figure 5D [Hamant et al., 2008; Heisler et al., 2010; Uyttewaal et al., 2012]). Strikingly, we observed a local increase of pSTM::CFP-N7 signal intensity around the ablation site from t = 18 h onwards (n = 16; Figures 5E and Video 3). The induction also seemed stronger in larger ablations than in smaller ablations, consistent with a greater range of stress perturbation in larger ablations (Figure 5—figure supplement 1). A similar response was also observed in the pBOUND>>GFP background, again with a delay (n = 12; Figure 5F and Video 4). While some degree of variability between individual plants at t = 0h could be observed, pBOUND>>GFP expression was also consistently induced after ablation (Figure 5F). We also noticed that with both markers, the induction of STM was not homogeneous around the ablation site. In particular, STM was never induced at the base of meristem, that is in the differentiating cells from the upper part of the stem. This is consistent with the prevailing view from the literature stating that the competence to express STM is limited to meristematic cells sensu stricto, and our data suggest that such a prepattern cannot be overridden by mechanical perturbations. pSTM::CFP-N7 after an ablation (relates to Figure 5E). pBOUND>>GFP after an ablation (relates to Figure 5F). To confirm these results, we analyzed the distribution of STM mRNA by whole mount in situ hybridizations on shoot apices after ablation (Rozier et al., 2014). Even though this method is only semi-quantitative, we could detect an asymmetric signal, with a higher intensity near the ablation site, consistent with the results obtained with the pSTM::CFP-N7 and pBOUND>>GFP lines after ablation (Figure 5—figure supplement 2, n = 9). Note that ablation may also provide increased accessibility to the probe. Last, to check whether STM expression would be enhanced by wound-induced jasmonate production, we incubated shoot apices with 100 μM jasmonate over night. In these conditions, we did not observe any significant induction of pSTM::CFP-N7 signal in most of the plants (N = 10/14, Figure 5J), and slight fluctuations in CFP signal in the remaining ones (N = 4/14, Figure 5K). Based on these results, we cannot rule out completely that jasmonate interferes with STM expression. Yet, as this contrasts with the systematic and steady induction of STM after ablation and with the robust induction of a pJAZ10::GUS reporter by jasmonate (Figure 5L-O), wound-induced jasmonate is not the most likely candidate as a secondary messenger between stress and STM induction. To further confirm an induction of STM expression by mechanical signals, we next modified the mechanical stress level using isoxaben treatments. Isoxaben is a well-known inhibitor of cellulose synthesis; after treatment, walls become mechanically weaker, and thus tensile stress increases (Heisler et al., 2010; Uyttewaal et al., 2012). In these conditions, we could detect a global increase in pSTM-CFP-N7 signal intensity, when compared to that of the control (measurement on 10 nucleus of the central zone in the control (n = 6 meristems) and isoxaben-treated (n = 7 meristems); Figure 5G and H). This response was also confirmed in the pBOUND>>GFP background (control: n = 10, isoxaben: n = 20; Figure 5I). Note that pBOUND>>GFP was not induced in the entire meristem after isoxaben treatment, further demonstrating that mechanical perturbations cannot override the prepattern in the SAM. Because these different experimental setups have little in common except mechanical stress perturbation, we thus propose that STM expression can indeed be modulated by mechanical stress in the SAM. One may wonder whether such artificial mechanical perturbations could induce the expression of all meristematic genes, and in particular other boundary-expressed genes, as a non-specific stress response. To test this hypothesis, we first focused on PINOID (PID). Like STM in the boundaries, PID has an established role in organ separation and boundary function (Furutani et al., 2004; Reinhardt et al., 2003). In a pPID::PID-YFP line, we observed a more abundant signal at the boundary of the meristem, as in the pSTM::STM-Venus line (Figure 6A). As detailed expression data were lacking in the meristem, we first analyzed the activity of the PID promoter. We generated a pPID::CFP-N7 line and observed a pattern that somewhat echoes that of pSTM::CFP-N7. In particular, the CFP signal was detected in the entire meristem and was enhanced in the boundary domain (Figure 6B). The signal obtained in a pPID::AlcR ALcA::GFP line (pPID>>GFP) further confirmed this result, echoing the pBOUND>>GFP signal (Figure 6C and D). However, after ablation, PID expression was not affected in both the pPID::CFP-N7 and pPID>>GFP lines, in contrast to our results in the pSTM::CFP-N7 and pBOUND>>GFP line (Figure 6E–G, pPID::CFP-N7: n = 13; pPID>>GFP: n = 7). No induction could also be detected after isoxaben treatment in the pPID>>GFP line (Figure 6—figure supplement 1; n = 11). Therefore, in our hands PID expression appeared as a negative control for our mechanical perturbations: PID expression at the boundary may not depend on a mechanical signal. Conversely, it suggests that the induction of STM by mechanical stress retains some specificity. PINOID promoter activity is not affected by mechanical perturbations. (A–C) PINOID expression pattern in representative meristems: a higher expression of PINOID is observed in boundaries. (A) Expression pattern of the translational fusion pPID::PID-YFP. (B) Expression pattern of the transcriptional reporters pPID::CFP-N7. (C)Expression pattern of pPID>>GFP. (D) Orthogonal sections through the middle of the boundaries of the meristems presented in (A–C). (E–F) Time lapse of a representative meristems showing the absence of response of pPID::CFP-N7 (F, n = 13) after ablation when compared to the control (E, n = 6). (G) Time lapse of a representative meristems showing the absence of response of pBOUND>>GFP after ablations (control n = 14, ablation n = 7). Scale bars, 20 µm. To further check whether other boundary expressed transcription factors are induced by mechanical perturbations, we performed ablations in pCUC1::CUC1-GFP and pCUC3::CFP expressing meristems. As ablations are also inducing other signals than mechanical signals, such a test is not sufficient to know whether a gene is induced by mechanical stress. Yet, induction after wounding is a necessary condition for a gene to respond to mechanical perturbation and thus this simple test can help to identify genes whose expression is insensitive to mechanical stress. CUC1 and CUC3 belong to the NAC family of transcription factors and are two well-known regulators of boundary function at the shoot apical meristem (Aida and Tasaka, 2006). Note that in contrast to CUC3 for which a transcriptional fusion is sufficient to recapitulate boundary expression, CUC1 expression is restricted to the boundary via the post-transcriptional action of miR164, and thus strict boundary expression of CUC1 can only be observed in a translational fusion line (Sieber et al., 2007; Laufs et al., 2004). After ablations, no significant induction could be observed in the pCUC1::CUC1-GFP line (Figure 6—figure supplement 2; n = 11). For instance, when comparing the time points before and 24 h after ablations, GFP signal intensities were roughly identical and the GFP pattern could not be easily related to the wound position or shape. Later on, as the meristem recovered from the wound, new boundaries were initiated in which new GFP signal could be observed, again with no relation to the ablation position or shape (Figure 6—figure supplement 2). Sometimes, the new CUC1-GFP signal even formed a line perpendicular to the wound edge, corresponding to the initiation of the boundary of following organs (Figure 6—figure supplement 2, bottom panels), in contrast to pSTM::CFP-N7 and pBOUND>>GFP induction that always appear and further consolidates along the wound edge. In other words, the cycle of CUC1 induction at the boundary went on largely undisturbed, independent of the presence of a neighboring ablation. Altogether, this strongly suggests that CUC1 expression at the boundary is also not controlled by a mechanical signal. The response of the pCUC3::CFP line to ablation was completely different than that of the pCUC1::CUC1-GFP line. In the pCUC3::CFP line, we observed a strong and steady induction of CFP signal after ablation in all the analyzed meristems (n = 20). Interestingly, this induction seemed to appear earlier than in the pSTM::CFP-N7 line, as a strong induction could be detected as early as t = 6 hr after ablation (Figure 6—figure supplement 3). Although these data may suggest that CUC3 expression is controlled by a mechanical signal, further tests would be required to reach such a conclusion. Nonetheless this demonstrates that boundary expressed transcription factors, even from the same family, are not systematically induced by wounding and, thus, that the mechanical induction of STM retains some specificity. Another issue raised by our mechanical perturbations is the relatively long time responses (8 to 24 hr) for STM to be induced. While this is consistent with the relatively slow timing of organ emergence and boundary folding in Arabidopsis meristems (Kwiatkowska, 2004; Reddy et al., 2004; Grandjean et al., 2004), it strongly suggests that the induction of STM expression after mechanical perturbations is indirect and could involve secondary signals, such as hormones. In line with this hypothesis, mechanical signals in animal development have all been shown to interfere with established biochemical signal transduction pathways (e.g. [Janmey et al., 2013; Jaalouk and Lammerding, 2009; Orr et al., 2006]). Auxin signaling could again play such a role at the boundary, as the polarity of the auxin efflux carrier PIN1 depends in part on membrane tension (Heisler et al., 2010; Nakayama et al., 2012). Based on these data, a scenario emerges where mechanical stress would control PIN1 localization at the boundary, which in turn would locally deplete this domain from auxin, leading to a local induction of STM expression. Although our previous results suggest that STM expression at the boundary does not solely rely on auxin depletion (based on a global auxin treatment, see Figure 4C,D), it does not formally exclude the possibility that the contribution of mechanical stress in STM expression at the boundary is mediated by local auxin gradients. In other words, whether mechanical stress impacts STM expression independently of the response of PIN1 to mechanical stress is unknown. First, we checked whether mechanical stress can affect the distribution of auxin in the SAM. To do so, we performed a series of ablations on meristems expressing the DII-Venus sensor. Such treatments induce a local reorientation of PIN1 around the ablation (Heisler et al., 2010), i.e. parallel to the new stress pattern, and should lead to the local depletion of auxin. After ablation and despite some variability in the basal level of DII-Venus signal on meristems recovering from NPA treatment (Figure 7A), we indeed consistently observed an induction of DII-Venus signal around the site of ablation (n = 21; Figure 7B, Video 5). Interestingly, the first effect of mechanical stress on DII-Venus signal was detected around 4 to 8 h after ablation, which is consistent with the timing of the response of PIN1 after ablation (ca. 4 hr [Heisler et al., 2010]) and the subsequent response of pSTM::CFP-N7 after mechanical perturbation (8 to 18 hr after compression or ablation respectively, this study). The DII-Venus signal was also induced after compression (Figure 7C) further matching the response observed in the pSTM::CFP-N7 line. Altogether, this suggests that auxin patterns and mechanical stress fields act synergistically to control STM expression at the boundary. STM response to mechanical perturbations can be uncoupled from PIN1-dependent auxin distribution. (A) Time lapse of representative meristems from a NPA-grown plant and expressing DII-Venus. From t = h, the plants are not exposed to NPA anymore. (B) DII-Venus-N7 signal increases after ablation: Time lapse of a representative meristems from a NPA-grown plant and expressing DII-Venus as in C, after ablation (Control n = 15, Ablation n = 21). (C) Representative DII-Venus signal before and after compression. An increased signal is usually detected after 4 to 8 hr after compression in the overall meristem (n = 10). 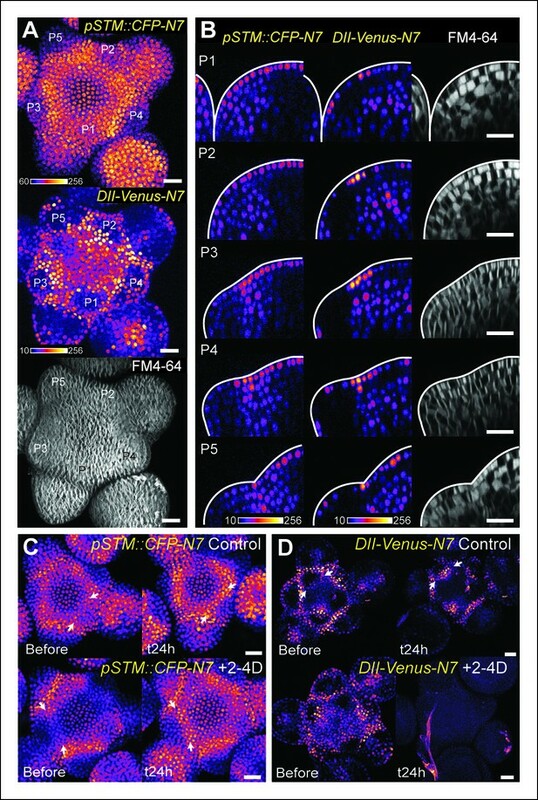 (D) Representative pin1-6 meristem expressing DII-Venus-N7 and pSTM::CFP-N7: the presence of CFP signal at the pseudo-boundary does not correlate with DII-Venus-N7 signal anymore (n = 6). (E) Representative pin1-6 meristem expressing pBOUND>>GFP showing the presence of GFP signal in a pseudo-boundary (n = 7). 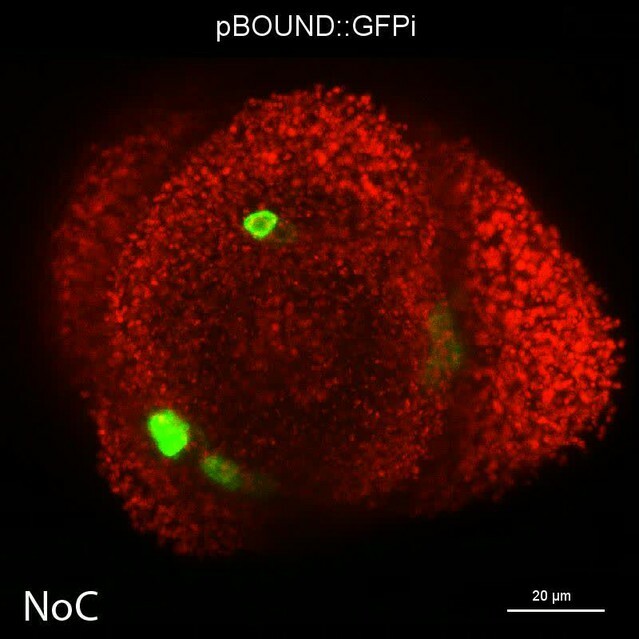 (F) Representative pin1-6 pBOUND>>GFP meristem after ablation: pBOUND>>GFP is induced around the site of ablation (n = 14). 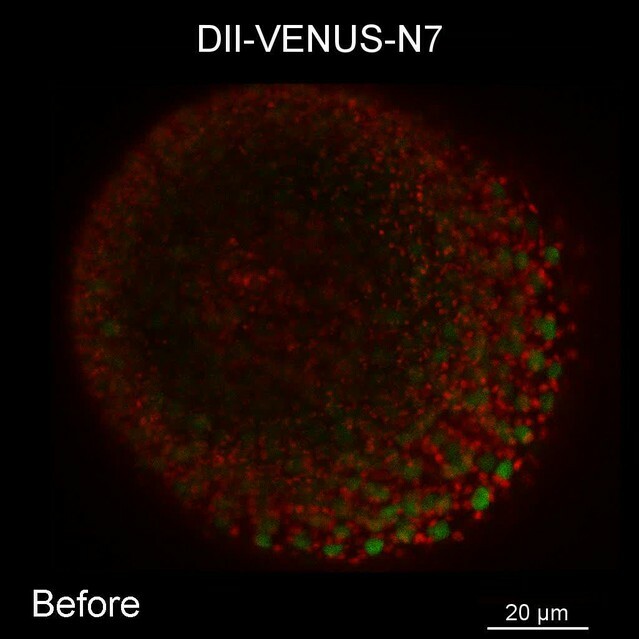 (G) Representative pin1-6 DII-Venus-N7 pSTM::CFP-N7 meristem after ablation: pSTM::CFP-N7 is induced around the site of ablation but DII-Venus-N7 is not (n = 10). Scale bars, 20 µm. DII-Venus-N7 after an ablation (relates to Figure 7B). Next, we investigated whether the mechanical induction of STM depends on PIN1. First, we analyzed the DII-Venus signal in the pin1-6 background. Although polar auxin transport in the meristem is largely inhibited, this mutant can generate bulges and sometimes ill-shaped flowers suggesting that compensatory mechanisms can be induced (Figure 7D and E; [Okada et al., 1991]). Because some degree of organogenesis is present in the pin1 mutant, this allowed us to observe boundary formation in this background. To distinguish this form of organogenesis from what we observed in the WT, we use the word 'pseudo-boundary' in pin1-6. Despite the variability in DII-Venus signal in the pin1-6 meristems, we could not detect any DII-Venus signal in pin1-6 pseudo-boundaries, suggesting that PIN1 is necessary to deplete auxin from the boundary (Figure 7D, n = 6). Interestingly, both pBOUND>>GFP and pSTM::CFP-N7 signals were present in the pin1-6 pseudo-boundaries (Figure 7D and E), thus suggesting that PIN1 is not a major player in the correlation between tissue folding and STM expression. To further confirm this result, we performed mechanical perturbations in the pin1-6 DII-Venus pSTM:CFP-N7 background. No significant induction of DII-Venus signal could be detected after ablation in pin1-6 demonstrating that auxin depletion after ablation mainly relies on PIN1 (n = 11, Figure 7G; Figure 7—figure supplement 1). However, both pSTM::CFP-N7 and pBOUND>>GFP were systematically induced around the site of ablation (Figure 7F and G; Figure 7—figure supplement 1 and 2). This demonstrates that the induction of STM after ablation can occur independently of PIN1. While we cannot rule out the possibility that other auxin carriers substitute for PIN1 in the pin1 background, despite our efforts, the induction of STM around the ablation site could not be clearly correlated with DII-Venus signal intensity, suggesting that the induction of STM after an ablation is not primarily caused by a local reduction in auxin levels. In other words, STM expression and auxin distribution can be partially uncoupled and the correlation between tissue folding and STM expression always remains. Last, we used a recently developed protocol in which tissue folding is triggered by the local application of the microtubule depolymerizing drug oryzalin, in the presence of the auxin transport inhibitor NPA (Sassi et al., 2014). In these conditions, a lateral outgrowth can be induced at the periphery of the meristem, mimicking the first stages of organ emergence. In both the pBOUND>>GFP and pSTM::CFP-N7 lines, oryzalin-triggered tissue folding led to a slight increase of GFP and CFP signals respectively, in the young boundaries (Figure 7—figure supplement 3). Because this induction occurred in the presence of NPA and as oryzalin indirectly modifies the mechanical status of cell walls (and thus promotes organ emergence), this further supports a scenario in which mechanical stress can promote the expression of STM at the boundary, relatively independently of auxin distribution. Because tissue folding is generally associated with the presence of high mechanical stress levels, crease formation is a unique event in development where the biochemical regulation of morphogenesis may also involve a strong contribution of mechanical signals. For instance, the patterning genes Twist and Notail are induced by the deformation of the embryo during gastrulation and epiboly in Drosophila and Zebrafish embryos respectively, through the activation of the β-catenin pathway (Brunet et al., 2013; Farge, 2003; Desprat et al., 2008). This suggests that shape changes are not only the result of biochemical regulation, but are also the source of mechanical signals that further channel morphogenesis via the control of gene expression. Our observations are in line with these conclusions: we report that the expression of STM at the boundary of the shoot apical meristem is correlated with tissue folding and is increased by mechanical stress. This provides a scenario in which biochemical factors, such as auxin, promote differential growth and shape changes in the meristem, which in turn, generate mechanical signals that can impact the expression of some of these regulators. Incidentally, our work also echoes results from Drosophila embryo where tension lines acting as genetic and mechanical boundaries have been revealed in the wing disk and shown to compartment cell identities (Aliee et al., 2012; Landsberg et al., 2009). Here we show that mechanical stress at the boundary contributes to the local expression of STM that is in turn necessary for the separation between organs. Note that tensile stress at the meristem boundary becomes anisotropic before tissue folds, as maximal stress direction is first prescribed by differential growth. In this respect, our results might thus be extended to other tissues like leaves or embryo, where the induction of KNOX genes would be related to differential growth, and thus stress, before tissue folding. Beyond organ separation, the boundary has many other functions. In particular, it is the site where new meristems, called axillary meristems, can be initiated. Interestingly, overexpression of class I KNOX genes is sufficient to induce ectopic meristems (Chuck et al., 1996). The boundary also plays a crucial role in plant architecture: this is where auxin is redistributed from the adjacent neighboring organ to the meristematic pool where new organs or new axis need to be initiated (Heisler et al., 2005; Reinhardt et al., 2003; de Reuille et al., 2006). The central role of the meristem boundary in plants largely explains why this domain has received considerable attention over the past decades, albeit from a molecular genetics point of view mainly (Aida and Tasaka, 2006; Tian et al., 2014). The role of mechanical stress in the function and regulation of the boundary domain of the meristem opens the possibility that other functions than organ separation are influenced by mechanical signals. Another question raised in this work is that of the coordination between mechanical and biochemical signals to control development. In animals, well-known elements of biochemical-based transduction pathways are involved in mechanotransduction. For instance, integrin, β-catenin or YAP/TAZ are all involved in transducing mechanical signals (e.g. Janmey et al., 2013; Jaalouk and Lammerding, 2009; Orr et al., 2006). Such intermingling raises the question of whether these signals can really be uncoupled with one another and this may even question the added value of mechanical signals in development. This is what we touched upon by analyzing the coordination between the plant hormone auxin and mechanical stress in the meristem. While we provide further evidence supporting a strong coordination between STM expression and auxin depletion, we also found that the response to mechanical stress can uncouple them. In particular, mechanical perturbations induce STM expression even when auxin transport or level is affected. In addition, mechanical stress does not seem to impact the expression of PINOID, which has been associated with the control of PIN1 polarity and thus auxin patterns in the meristem (Robert and Offringa, 2008). This is thus a case where two redundant signalling pathways act relatively independently to control the same morphogenetic event. We propose that the absence of a strict coupling between auxin depletion and mechanical stress is a way to add robustness in meristem functions at the boundary. Incidentally, this highlights the added value of mechanical signals in this domain. Alternative cues may be involved in the promotion of STM expression at the boundary. In addition to auxin, STM has been associated with the homeostasis of cytokinins, gibberellins and ethylene. Activation of STM promotes the expression of the cytokinin biosynthesis gene AtIPT7 and cytokinin response factor ARR5 (Yanai et al., 2005). Conversely, overproduction or application of cytokinins increase the expression level of STM and can rescue weak stm mutant alleles (Rupp et al., 1999; Jasinski et al., 2005). This interaction with cytokinins is largely shared among the different class I KNOX genes and, consistently, it has been shown that KNAT1 and KNAT6 display redundant functions with STM. Interestingly, the level of cytokinins has been predicted to increase in the boundary, based on the cytokinin activity reporter pTCS signal, and axillary meristem formation has been shown to require cytokinin signalling (Wang et al., 2014), consistent with the well-known bushy phenotypes of cytokinin overproducers. Temporally, this cytokinin burst would follow the initial reduction in auxin level at the boundary (Wang et al., 2014). Thus cytokinin, in parallel to and after auxin depletion, may very well contribute to STM induction at the boundary. Class I KNOX proteins also reduce gibberellins levels, notably through a direct repression of the GA-20 oxidase gene (Sakamoto et al., 2001; Chen et al., 2004); conversely gibberellins can rescue the phenotype of KNOX overexpressors (Hay et al., 2002). The induction of the gibberellin catabolism gene GA-2 oxidase was also shown to depend on KNOX proteins (Jasinski et al., 2005). While both cytokinins and gibberellins are tightly linked to class I KNOX gene expression, the potential interplay with mechanical stress has not been explored. In contrast, other hormones, such as ethylene, have been associated to the plant response to many stresses. 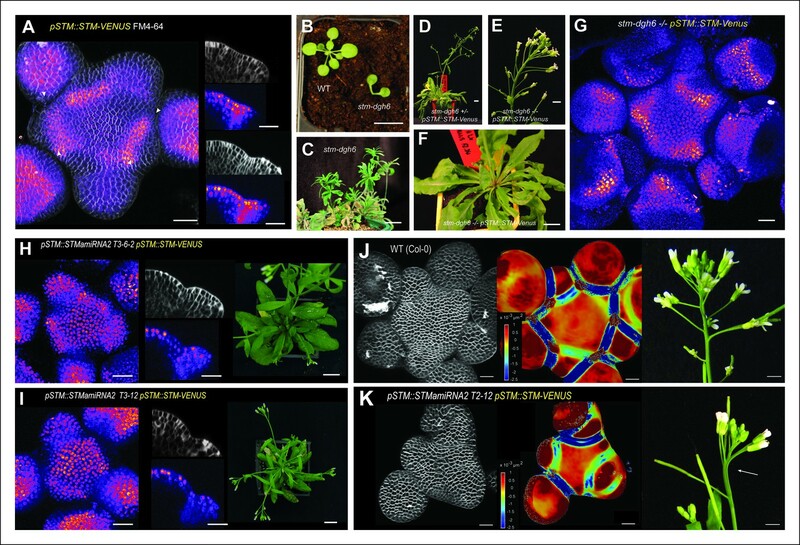 Interestingly, ethylene restricts the expression of class I KNOX gene KNAT2 in the shoot meristem to the boundary domain (Hamant et al., 2002). Note however that the exact contribution of ethylene in mechanoperception remains debated. For instance, while touch can induce ethylene synthesis, ethylene response mutants still display thigmomorphogenesis in response to touch (Chehab et al., 2012); touch-induced thigmomorphogenesis rather depends on jasmonate (Chehab et al., 2012). While certain hormones are rather associated with repetitive elastic deformations (like touch or wind), others are involved in continuous plastic deformations (i.e. growth and shape changes), these may be better candidates for the regulation of STM expression at the boundary. More generally, and as auxin does not seem to act as a secondary messenger of mechanical signals for STM expression, another exciting prospect for this work will be to identify the elements of the mechanotransduction pathway acting on STM at the boundary. The current dissection of the gene regulatory network acting at the boundary (e.g. [Tian et al., 2014]) should help us weigh the putative contributions of these biochemical factors in transducing mechanical signals at the SAM in the future. As illustrated in the art of origami, folding can in principle generate the widest diversity of shapes from simple inputs. In the past decades, there has been tremendous progress in the identification of genes that trigger such events in all living organisms. The robustness of such a complex regulation is often thought to rely on redundancy between different molecular pathways. Here we have investigated whether the shape itself, and its associated mechanics, interferes with gene expression and channels morphogenesis by constraining the possible outputs of the gene regulatory network. If generalized, such a dialog between gene and form could help us understand how reproducible shapes can emerge from a complex gene regulatory network that is susceptible to noise. Because of its essential function in morphogenesis and its impact on developmental robustness, this 'shape to gene' feedback may also have far reaching implications in evolution. 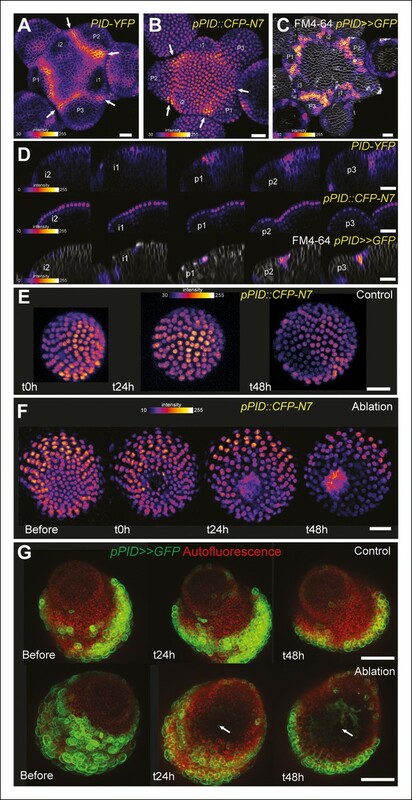 The pBOUND>>GFP, DII-Venus, pin1-6, stm-dgh6 lines were already described in the literature (Brunoud et al., 2012; Vernoux et al., 2011; Laufs et al., 2004; Dharmasiri et al., 2005; Vernoux et al., 2000; Aida et al., 2002). The pCUC1::CUC1-GFP and pCUC3::CFP lines have recently been described (Goncalves et al., 2015). Note that the Mo223::GFP line (Cary et al., 2002) was also used to test the response of the CUC1 promoter to ablations. The pJAZ10::GUS used as control for the JA treatment has also been previously described (Mousavi et al., 2013). The pSTM::CFP-N7, pPDF1::CFP-N7 and pPID::CFP-N7 lines were generated by fusing either the 5,7 kb region upstream of STM (AT1G62360) ATG, the 1456 pb region upstream of PDF1 (AT2G42840) ATG, or the 4 kb region upstream of PID (AT2G34650) ATG to a CFP targeted to the nucleus through a N7 signal in a pH7m34GW vector using the Gateway system and transformed in Col0 ecotype. The pPID>>GFP line was generated by fusing the 4 kb region upstream of PID (AT2G34650) ATG to the Alc-R coding sequence fused to an pAlcA::GFP-ER in a derivate of the pGREEN129 plasmid and transformed into the WS-4 ecotype. The pSTM::STM-Venus line was generated by transforming the plasmid described by Heisler et al. (Heisler et al., 2005) in Col-0 plants. The STMamiRNA line (binding to the STM coding sequence though the following sequence: TTAACCACTGTACTTGCGCGA) was designed and amplified from the pRS300 plasmid following previously described protocol (http://wmd3.weigelworld.org/cgi-bin/webapp.cgi) and fused to the pSTM promoter in a pK7m34GW vector using the Gateway system. The construction was transformed either in Col-0or in the pSTM::STM-Venus line. pBOUND>>GFP and pPID>>GFP expression was induced by an overnight treatment with 70% ethanol vapor following a previously described protocol (Deveaux et al., 2003). 'Greenhouse grown plants' were initially grown in short-day conditions (8 hr/16 hr light/dark period) for one month and then transferred to long-day conditions (16 h/8 h light/dark period). Stems were cut and the SAM was dissected when the inflorescence meristem was visible, i.e. between the appearance of the first flower to the appearance of first silique (stages 13 to 17 [Smyth, 1990]) and transferred on a half MS medium with vitamins and 0.125 µg/µL of BAP for imaging as already described (Fernandez et al., 2010). "In vitro grown plants” were grown in a phytotron in long day conditions on Arabidopsis medium (Duchefa, Haarlem, the Netherlands) supplemented with 10 µM NPA to inhibit flower initiation and generate naked meristems. NPA-treated in vitro grown plants were transferred to a medium without NPA as soon as naked meristems were formed as already described (Grandjean et al., 2004). Meristems were then imaged from 24 hr to 48 hr after transfer on the NPA-free medium. For in vitro experiments on pin1 meristems, plants were grown in vitro on MS medium without NPA in a phytotron in long day conditions. Dissected meristems and plants grown in vitro were imaged in water using either a LSM700or a LSM780 confocal microscope (Zeiss, Germany) to generate stack of optical sections with an interval of 0.25, 1or 2 µm between slices. In some cases, membranes were stained with FM4-64 and the signal in the L1 was extracted using the Merryproj software as described in de Reuille et al., (de Reuille et al., 2005). Longitudinal optical sections of various thicknesses were performed using the ImageJ software. In many cases, the Fire lookup table from ImageJ was used to represent the CFP signal intensity and background signal from raw images was reduced in images, by modulating the minimum level of intensity in ImageJ as shown by the calibration bars on the different pictures. The minimum level was however never above 50 out of 256 in intensity and the same processing was applied on all time points, and on control and assay alike. In some projections from of pSTM::STM-Venus and pSTM::CFP-N7 where the signal was weak, area outside the nucleus emitting in both green and red channels and corresponding to either the auto-fluorescence of the plasts or the FM4-64 signal were automatically removed using the function calculator-plus subtraction of ImageJ. The maps and quantifications of meristem curvature and pSTM::CFP-N7 signal at cellular levels were obtained using the MorphographX software (www.morphographix.org). The curvature maps were generated by plotting the mean Gaussian curvature on either non-segmented or cell-segmented meshes with a neighboring of 15 µm. The maps of pSTM::CFP-N7 signal were generated by blurring the CFP signal with a radius of 10 µm and projecting it on the cellular mesh with a thickness of 10 µm. Note that the oldest organs were not included in the quantifications because of the inability of the mesh to follow the surface of the meristem in very deep boundaries and to extract well the pSTM::CFP-N7 signal in these area. Furthermore, cells at the extremities of the mesh were also not included in the quantifications due to the presence of aberrations of Gaussian curvature on these parts of the mesh. Organ size was quantified using ImageJ: stacks were projected using the function z-stack, a circle was drawn using the freehand selection around each organ viewed from the top and the surface inside this selection was automatically measured. The folding angle of the boundary was measured manually on longitudinal sections taken in the middle of each boundary using the angle tool of ImageJ. For the quantification of the pSTM::CFP-N7 nuclear signal after Isoxaben treatments or after ablations, each nucleus from the central zone (Isoxaben treatment) or from the peripheral zone (around the site or on the opposite site of the ablation) was isolated manually using the ImageJ software on the slice from the z-stack where its size and intensity was the highest. A circle was manually fitted around each nucleus and the integrated intensity was calculated in this circle. 10 nuclei were measured for each meristem. The quantification of nucleus signal intensity after Isoxaben treatment was performed on one of two sets of individual plants (see Supplementary file 1). Each experiment was performed on at least two independent sets of plants, and with at least 4 independent plants in each set. In all experiments, the t = X hr time point corresponds to X hours after the beginning of treatment. Controls and assays were analyzed in parallel (same growth conditions, same imaging conditions). The compressions, ablations and isoxaben treatments that were carried out on WT plants were performed on plants previously grown in vitro NPA and transferred in a medium without NPA 0 to 24 hr before the beginning of the experiment. The ablations were performed with a needle or using a pulsed UV laser as already described (Hamant et al., 2008; Uyttewaal et al., 2012). Note that the ablations performed on pin1-6 meristems were performed on plants grown in vitro on NPA-free medium. The isoxaben treatments were conducted by immersing the plants in solutions of 5 to 20 µM of isoxaben overnight (for 12 to 14 hr, Heisler et al., 2010; Uyttewaal et al., 2012). Controls were obtained by water immersion with an equivalent volume of Dimethyl Sulfoxide (DMSO). All these concentrations gave similar results. The presence of isoxaben in the meristem could be confirmed by its impact on meristem, cell and nucleus size. For the auxin treatments, dissected meristems in half MS Vitamins and BAP boxes were immerged in a solution of 10 µM of 2-4D overnight (for 12 to 14 hr). Controls were obtained by immersing the meristem in a solution of equivalent volume of water. Similar experiments were also performed on plants grown in vitroand recovering from an NPA treatment and with IAA and gave similar result (data not shown). 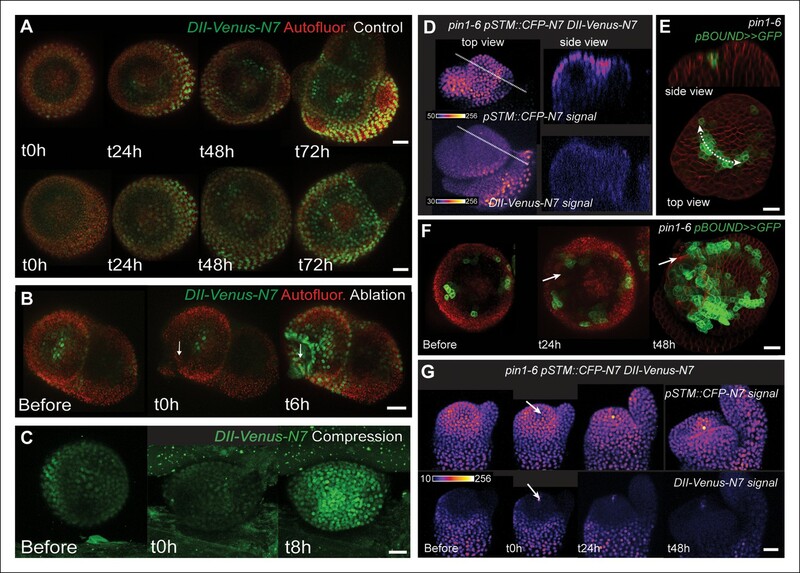 The disappearance of the DII-Venus-N7 signal reflected the presence of high auxin levels in treated meristems. For jasmonate treatments on pSTM::CFP-N7 and pJAZ10::GUS, jasmonic acid (Sigma) was diluted in 100% Ethanol to make a stock solution. JA was then diluted in water (1/1000) for the treatments. NPA grown plants in Arabidopsis medium exhibiting naked meristems and recovering from the NPA treatment were fully immersed overnight (12 to 14 hr) in a water solution containing 100 µM of JA or in a similar dilution of ethanol for the control. Oryzalin applications in lanolin paste were carried out as previously described (Sassi et al., 2014). To reveal the presence of GUS activity in the pJAZ::GUS plants grown on NPA and treated with jasmonate, the samples were first immersed overnight at 37°C in a GUS solution (100 mM Na2HPO4 pH7, 5 mM K4Fe [CN]6·3H20, 5 mM K3Fe [CN]6, 0.05% Triton-X-100, 0.5 mg/ml X-Gluc) before being cleared trough successive ethanol baths (from 70 to 100% Ethanol). Imaging was performed with a Zeiss stereomicroscope Discovery V20. The whole mount immunolocalizations of PIN1 were performed on WT plants (WS-4 ecotype) as previously described (Besnard et al., 2013). Imaging was performed with a Zeiss LSM700 microscope. The whole mount in situ hybidization of STM mRNA was performed as previously described (Rozier et al., 2014). Imaging was performed with a Zeiss stereomicroscope Discovery V20. The stm-dgh6 mutant was originally identified in the Versailles T-DNA collection. In this allele the T-DNA is inserted between nucleotide 723 and 724 in the cDNA sequence. To genotype the stm-dgh6 populations, we used the forward primer GGGTAAATACCCCTTTGATGG (before the T-DNA insertion) and reverse primer TCGTTCCTTATCCTGAGTTG (in the following gene). This amplified a 2600 bp long fragment in the WT and stm-dgh6 heterozygote, and nothing in the stm-dgh6 homozygote. Conversely, to detect the presence of the T-DNA, we used the forward primer CGTGTGCCAGGTGCCCACGGAATAGT (LB4, T-DNA) and reverse primer GTAGTGACGGCTCCACCAAT (STM). This amplified a 300 bp long fragment in the stm-dgh6 heterozygote and homozygote, and nothing in the WT. The qPCRs for STM and STMamiRNA were performed on 2 week-old seedlings grown on ½ MS medium with kanamycin. The qPCRs on the pSTM::STMamiRNA lines were performed on either homozygous or heterozygous F3 populations. The qPCR on WT plants was performed on plants harboring a kanamycin resistance at homozygous state and growing in the same conditions as the pSTM::STMamiRNA lines. As shown in Figure 3—figure supplement 2, the expression of the amiRNA (Primers: STMamiRNA Q5: CACTGGTTATTCACAGGTCGTG, STMamiRNA Q3: CAGTGGTTAATCAAAGAGAATCAATG) and its effect on STM expression was checked by qPCR (Primers: qSTM-F: TCGACTTCTTCCTCGGATGACCCA, qSTM-R: TCTCCGGTTATGGAGAGACAGCAA). Three independent biological replicates were at least used for each sample. Expression is shown relative to that of TCTP, a stable housekeeping gene. Current Opinion in Plant Biology 9:72–77. Physical Review Letters, 91, 10.1103/PhysRevLett.91.086105. Plant Signaling & Behavior 9:e28788. Journal of Experimental Botany 64:5753–5767. Proceedings of the National Academy of Sciences of the United States of America 103:1627–1632. Proceedings of the National Academy of Sciences of the United States of America 105:18818–18823. Journal of Plant Growth Regulation 19:7–18. Nature Reviews Molecular Cell Biology 10:63–73. Journal of Experimental Botany 54:1585–1595. Journal of Experimental Botany 55:1021–1032. Nature Reviews Molecular Cell Biology 8:633–644. Current Opinion in Plant Biology 11:495–502. Proceedings of the National Academy of Sciences of the United States of America 102:3318–3323. Australian Journal of Plant Physiology 17:323–331. Thank you for sending your work entitled "Mechanical stress channels STM expression in the Arabidopsis meristem" for consideration at eLife. Your article has been evaluated by Detlef Weigel (Senior Editor), a member of our Board of Reviewing Editors, and three reviewers, one of whom, Gabriel Monshausen (Reviewer 3), has agreed to share his identity. We are in principle interested in the work, but the reviewers have also identified a series of concerns. Below you can find the individual comments of the three reviewers, and we would like to ask you to address them point-by-point. 1) A key aspect of your paper is your claim that STM expression is mechanosensitive. However, given the considerable lag between the mechanical insult and the change in STM expression, the reviewers feel that alternative interpretations are still valid and the claim that the STM promoter is mechanosensitive is overstated. We would therefore like to ask you to perform a more comprehensive analysis to strengthen your idea. For example, how does STM expression react to transient mechanical stimuli, such as pinching? Moreover, we would like to ask you to perform experiments to exclude the possibility that the observed expression changes are due to a wounding response. Analysis of STM expression upon local jasmonate application is one experiment that can be helpful here. Demonstrating that the behavior of the STM reporter is unchanged in the JA signaling mutant coi1 would be another option. (We are aware that others have suggested that JA may be involved in thigmotropism, but it appears that those effects are probably rather indirect). 2) There are some questions about the specificity of your observations. If there is indeed causality linking mechanical stress and STM expression rather than correlation only, one could expect that this does not hold for any gene expressed in the boundary region. Performing the key experiments with other genes that are expressed in the boundary region could answer this question. Such control experiments should focus on other transcriptions factors. 3) Please also carefully address some technical issues. It would be especially important to demonstrate that your assumption that the amiRNA construct preferentially downregulates STM in the boundary region is true. Combination of this construct with a STM protein fusion reporter could substantiate this claim. Reviewer #1:The authors of this paper are attempting to advance the hypothesis that mechanical stress in the shoot apical meristem turns on expression of the STM transcription factor which then acts to mediate the separation between organs. 1) Show a correlation between STM reporter expression and curvature. The authors do a convincing job of establishing this correlation. 2) Show that the STM reporter is activated by mechanical stress. Mechanical stresses are applied to the apical meristem in the form of ablation or compression. STM reporter expression increases but with a long lag such that the authors conclude this is a secondary effect of mechanical stimulation. They attempt to connect the mechanical stimulus to alterations in STM reporter expression via the auxin pathway but experiments show that the mechanically induced changes in the auxin pathway cannot easily explain the changes in STM expression. 3) Show that STM expression in the boundary zone is required for organ separation. The requirement for STM function in organ separation has been shown previously (Long and Barton, Development, 1998; Belles-Boix et al., 2006) making this experiment largely confirmatory. While the authors might argue they specifically knock down STM function in the peripheral zone, this is complicated by the observation by other labs (e.g. Jackson lab, Kim et al., 2003, Development) that STM protein can move from its site of synthesis into adjacent cells. Therefore, using a microRNA in the boundary zone would affect the action of STM in both this zone as well as in any cells into which STM moves. 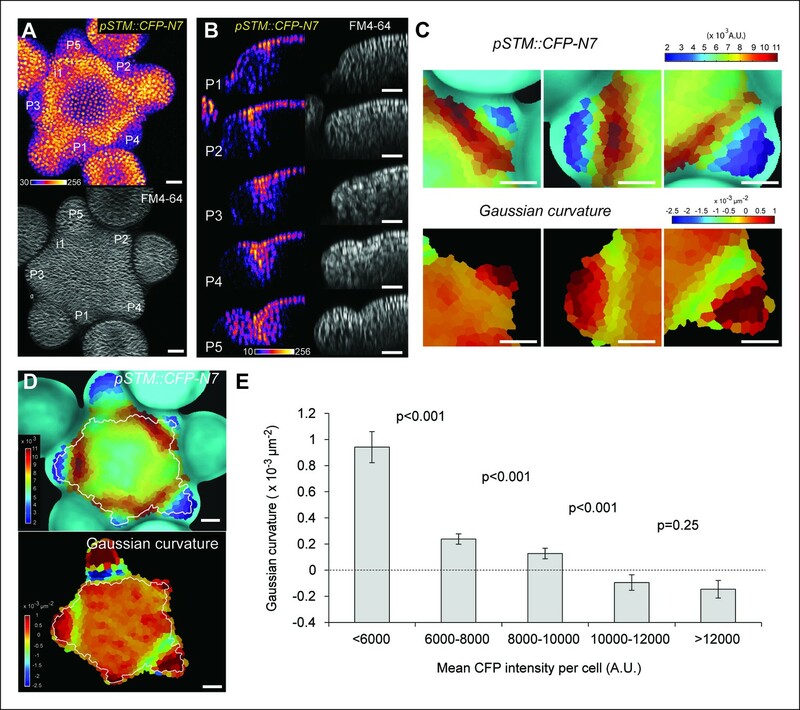 In summary, curvature and STM reporter expression are correlated in the shoot apical meristem. However, the experiments in this paper do not satisfactorily solve the question of causation. Because KNOX genes can cause alterations in curvature in otherwise smooth surfaces (e.g. Tsiantis lab work in Cardamine leaf; Long and Barton, 1998, Development, for work in the Arabidopsis embryo), the simplest explanation seems to be that STM causes the alterations in curvature by inhibiting cell division and/or cell expansion at the boundary. A mechanism for this is suggested by findings by the Hake lab showing that KNOX targets include genes involved in auxin transport as well as genes involved in cell wall synthesis. As for the experiments showing that mechanical stress induces STM expression, it is possible that many types of wounding or perturbations to the shoot apical meristem will cause an indirect increase in STM reporter expression as the plant attempts to compensate for the insult. The authors should test additional stresses to see if this is a more general phenomenon. The authors should also extend the analysis to other "meristem genes" expressed especially in the boundary zone – CUCs, BOPs, JLO – to determine if this is specific to STM. Reviewer #2:The core message of this very interesting manuscript is that mechanical stress activates the expression of STM, a homeodomain transcription factor with key roles in maintaining meristem fate at the boundary of meristem and organ primordial and that STM is required for boundary formation and organ separation. The finding that an important developmental regulator is under control of physical forces in the growing organism while at the same time acting on shaping the organism is certainly of relevance to a wide audience. The experiments (mostly live cell imaging of fluorescent reporters, coupled to perturbations) and analyses shown are of high quality and are mostly well presented. However, in the present form the manuscript has several important shortcomings, which need to be addressed, but based on the exciting findings, I think it is a strong candidate for publication in eLife after revision. 1) The authors exclusively use a fluorescent reporter as proxy for STM activity, however, it does not faithfully recapitulate endogenous STM expression. The differences need to be addressed, preferably by in situ hybridization of reporter plants using STM and CFP probes. I think this experiment is essential validate the major claims concerning the responsiveness of STM expression to mechanical stimuli. Along these lines, I would also like to see that endogenous STM expression responds to a selected experimental stimulus, such as pinching. Again, these experiments could be done in the reporter line, comparing STM and CFP expression by qRT-PCR. These experiments would unequivocally demonstrate that the observed CFP induction is not an artifact of the reporter. 2) The boundary phenotype in the pSTM::STM rescue and amiRNA silencing plants is not documented properly. To be able to judge the phenotypes, we need SAM microscopy and curvature measurements. The pictures shown in Figure 3 are not very informative with regards to the boundary effect, rather they show overall growth habitus. 3) The boundary specific silencing supposed to be happening in the amiRNA lines is not documented. Again, in situ hybridization seems essential to analyze where STM silencing occurs, to be able to interpret the results shown in Figure 4E. 4) The claim the STM responds to mechanical stimuli after 8 hours onwards is not substantiated by the data presented. From the images shown in Figure 5 it seems that the first effects become visible only after around 20 hours. Please comment. 5) The authors routinely refer to "STM expression" when they are talking about pSTM::CFP reporter activity. Please be more careful with wording. 6) The claim that STM reporter expression is much higher after removal of NPA is not substantiated by the data shown in Figure 1–figure supplement 1. Reviewer #3:This interesting manuscript by Hamant and coworkers addresses the question of how the expression of STM, a key regulator of the shoot apical meristem also required for organ separation, is regulated. This is an important biological problem, which is explored by the authors using a range of sophisticated imaging, image processing and genetic tools. Overall this manuscript is very well written and the data provide strong experimental support for a role of mechanical stress in controlling STM expression patterns. 1) To analyze the relationship between mechanical stress, and more specifically Gaussian curvature, and STM expression, the authors mapped meristem curvature at high resolution and projected this onto a map of pSTM::CFP-N7 expression. These experiments convincingly show that negative Gaussian curvature is correlated with enhanced STM expression in the boundary domain of the SAM. 2) The authors further analyze whether STM expression in the boundary is functionally important for organ separation during development. To this end, STM-Venus preferentially expressed in the boundary was introduced into a strong STM mutant (dgh6). The resulting transgenic lines exhibited only a partial recovery of meristem maintenance but a complete loss of organ fusion defects. pSTM::STMamiRNA2 was introduced into WT to preferentially silence STM expression in the meristem boundary. This resulted in reduced, but functional meristems, and major organ fusions. These are creative attempts to specifically alter STM expression in the boundary region; however, no evidence is presented to actually confirm that such preferential alteration has actually occurred. It would have been informative to show the expression pattern of pSTM::STM-Venus not only in a WT background (Figure 3A) but in the dgh6 mutant line, as the expression pattern of the weakly expressing WT parent line (Heisler et al. 2005a) may not necessarily have been maintained after crossing. Similarly, it would be useful to know whether STM expression is preferentially silenced in the boundary in pSTM::STMamiRNA2 lines. Transformation of the constructs into pSTM::STM-Venus lines would have been informative. If these experiments are not done, the limitations should at least be discussed. 3) The authors convincingly demonstrate that enhanced STM expression in the boundary is correlated with but not dependent on local auxin depletion. Treatment with 2,4-D globally increased auxin levels in the SAM (as monitored using DII-Venus) but did not alter the pattern of STM expression (although slightly increasing the intensity of pSTM::CFP-N7 expression). One question this experiment raised for me was whether 24 hour incubation with 2,4-D altered meristem organization in any noticeable manner, i.e. were Gaussian curvatures in the boundaries affected by the treatment? According to the authors' model, this should have affected STM expression. 4) The authors provide strong evidence that mechanical perturbations (compression of meristem and local cell ablation) and pharmacological treatments resulting in altered mechanical stress (isoxaben, NPA+oryzalin) resulted in increased STM expression. Based on the authors' initial experiments, STM expression was correlated with negative Gaussian curvature. Does this relationship hold when the SAM is perturbed by the various treatments described here? This analysis could greatly strengthen the concept that STM expression is regulated by a specific type of mechanical stress. Thank you for resubmitting your work entitled "Mechanical stress channels STM expression in the Arabidopsis meristem" for further consideration at eLife. Your revised article has been favorably evaluated by Detlef Weigel (Senior Editor), a Reviewing Editor, and three reviewers, one of whom, Gabriel Monshausen (Reviewer 3), has agreed to share his identity. The manuscript has been improved but there are some remaining issues that need to be addressed before acceptance. All reviewers and the editors agree that your work is interesting and original, but as you can see from their comments, the reviewers still have some questions about the causality relations put forward in your study. Yet, there is also consensus that this is a hard chicken-and-egg type of problem, and a completely unambiguous answer is hard to come by with current means. Although things might turn out somewhat different in the long run, your study presents one of the best ways forward into this area for the moment, and is likely to stimulate further research. In light of this, we believe that it would be in your own interest to be very careful how you phrase your conclusions. Please go once more through your manuscript and tone down any strong statements with respect to situations that entail a possibly circular logic. In that respect, please pay particular attention to the comments of reviewer 1. Please also clarify the following: there is some doubts whether the experiments show jasmonate insensitivity of STM expression as stated in the text. In the supplemental figure, there is clear STM expression increase that does not occur in any of the mock treated samples. It thus appears simply wrong to say it is insensitive, and these results should not be "hidden" in the supporting information. Reviewer #1: This paper presents several interesting observations. My problem with the paper – even after the changes and in some cases even more so after the authors' additions – is that the authors shoehorn their observations into a model in which mechanical stress increases STM expression. "The fact that STM expression correlates with curvature at the boundary can simply be explained by the fact that STM reduces the growth rate at the boundary, leading to tissue folding. KNOX genes can cause alterations in curvature in otherwise smooth surface (Long and Barton, 1998, Barkoulas et al., 2008). The impact of STM on crease formation at the boundary could be mediated by inhibiting cell growth in this domain. Consistent with this scenario, KNOX target genes include genes involved in auxin transport as well as genes involved in cell wall synthesis (Bolduc et al., 2012). However the strong correlation between STM promoter activity and tissue folding suggests that a signal, which is related to curvature, could add robustness to the STM expression pattern at the boundary." Whatever the reality may be, in this paper alternative interpretations are downplayed. There is no mention of alternative models in the Discussion and the title is overly strong in its assertion given the weak, and by the authors' own admission, indirect, connection between physical stress and STM expression. Unfortunately, without the framework of mechanical stress acting to increase STM, the experiments presented in this paper lack cohesion. 2) The authors have added a test for response of STM expression to jasmonate, a hormone associated with wounding stress. This is an experiment to determine whether the response of STM expression to ablation might be in response to wounding. The data are given in the supplemental section (Figure 5–figure supplement 3). Most plants do not respond – however a significant fraction, 4 out of the 20 or so plants tested, did show an increase in STM expression in response to jasmonate. The authors dismiss this positive result as unimportant but I am not sure what the basis for their dismissal is. In short, the jasmonate experiments indicate that the situation is likely to be complex. Rather than sweeping this complexity under the rug, the authors should discuss it. 3) The authors add data for other boundary-expressed genes and find that one – CUC3, but not the other, CUC1, respond to ablation with increased expression. This is very interesting but I am not entirely sure what to make of it. Again, it reinforces the conclusion that the situation is complex. (I would add here as well that these experiments are done in NPA treated meristems and therefore the results hold for a context in which auxin is improperly localized. Since there is reason to believe that auxin and KNOX genes interact at some level, this is important to keep in mind. A different result might be obtained in the context of properly localized auxin). Reviewer #2:I am very happy with the thorough revision of the manuscript and the addition of many meaningful and well-executed new experiments. I now support publication of the manuscript without hesitation. The only issue I still have is the rather poor quality of STM in situ hybridizations after ablation. With some good will it is possible to identify enhanced STM RNA levels next to the ablation site, but it could be helpful to include more apices (if the authors have pictures available) to make that trend clearer. Reviewer #3:The authors satisfactorily addressed the issues that I raised previously; the manuscript is considerably strengthened by new experiments (i) showing insensitivity of STM expression to JA, (ii) confirming preferential downregulation of STM in the boundary region by STM amiRNA and (iii) demonstrating differential mechanosensitivity of CUC1 and CUC3 expression in SAMs. In the discussions between the reviewers and editors, a few key points emerged. Please pay particular attention to these:1) A key aspect of your paper is your claim that STM expression is mechanosensitive. However, given the considerable lag between the mechanical insult and the change in STM expression, the reviewers feel that alternative interpretations are still valid and the claim that the STM promoter is mechanosensitive is overstated. We would therefore like to ask you to perform a more comprehensive analysis to strengthen your idea. For example, how does STM expression react to transient mechanical stimuli, such as pinching? We agree with this comment. In the strictest sense, saying that STM promoter is mechanosensitive is an overstatement as it may suggest a direct relation to actors of the mechanotransduction pathways, even though the STM promoter takes several hours to be activated. We find that the STM promoter is rather the downstream/indirect target of a mechanotransduction pathway. We had highlighted the indirect nature of the induction at the end of our initial submission and we have now stated this earlier in the revised text. Here we need to dissect the meaning of mechanotransduction: the transduction of mechanical stress is achieved by various pathways, and these pathways highly depend on the nature of the mechanical stimulus. For instance, touch is an extrinsic, discontinuous mechanical perturbation that triggers thigmorphogenesis, and could for instance be coded in frequency. As an example, repeated stem bending can lead to stem thickening and this response can also lead to desensitization (e.g. Martin et al., 2010 J. Exp Bot). Another kind of mechanical perturbation is the intrinsic and continuous membrane tension in animal cells, leading to the inhibition of endocytosis, cytoskeleton reorganization and cell polarity (e.g. Houk et al., 2012 Cell). Tension also builds up in cell walls in plants: the slow extension of cell wall under turgor pressure, leading to wall thinning, triggers wall synthesis to compensate for wall weakening (Cosgrove 2005 Nat. Rev. Mol Cell Biol). Therefore mechanical cues can be either discontinuous or continuous in nature. The relevant mechanotransduction (and timing) will highly depend on the nature of these cues. Our data on STM are rather consistent with a response to intrinsic continuous tension than with discontinuous touch, and we have reworded the text in this revision to clarify this point. The role of intrinsic/continuous mechanical stress in gene expression starts to be uncovered in plants. For instance, the expression of the ELA1 gene has recently been shown to depend on the presence of mechanical signals in the growing immature seeds. In this context, mechanical perturbations induce a change in expression after 24 hours of prolonged exposure to stress (Creff et al., 2014 Nat. Com.). We tried pinching meristems. In fact, this can serve as a negative control for our ablation experiments: when a needle touches the surface without breaking the top cell wall, STM is not induced. This means that STM is induced only when high and prolonged tensile stresses are present. A similar response was observed for microtubule orientation in the meristem: microtubule reorient only when the top wall breaks, i.e. when continuous directional tensile stresses are induced (Hamant et al., 2008 Science). This observation is more in line with STM expression pattern maxima, which are not stochastic, are slow to change and correspond to regions under high and continuous tensile stresses. This means that STM could be the downstream target of the wall integrity pathway for instance (continuous stress), rather than the touch mechanotransduction pathway (intermittent stress). Consistent with this, we also tested the potential impact of jasmonic acid on STM induction and could not detect any significant induction (see below). Note that we observed that the induction of STM expression scaled to the size of the ablation; furthermore, in addition to ablations, we also performed compressions and isoxaben experiments, and these (continuous) mechanical perturbations also induce STM. In this revision, we have added STM in situ hybridization after ablation to confirm our finding, we have analyzed other boundary-expressed genes to demonstrate the specificity of the STM response to stress, and we have tested the role of JA in STM response. All these new data are consistent with our initial claim. See below for more details. Moreover, we would like to ask you to perform experiments to exclude the possibility that the observed expression changes are due to a wounding response. Analysis of STM expression upon local jasmonate application is one experiment that can be helpful here. Demonstrating that the behavior of the STM reporter is unchanged in the JA signaling mutant coi1 would be another option. (We are aware that others have suggested that JA may be involved in thigmotropism, but it appears that those effects are probably rather indirect). This is a good suggestion. We have applied JA (100 μM) on pSTM::CFP meristems and did not see any significant induction (while our pJAZ10: :GUS and pVSP2: :GUS positive controls were induced by such JA treatments, done in parallel). This confirms that STM is not induced by wounding stress, and also is more consistent with an absence of link with thigmomorphogenesis. Note that if compression and isoxaben treatments are likely to induce microcracks in cell walls, they do not induce wounding or cell death, yet they all lead to STM induction. We therefore believe that (continuous) mechanical stress is the most likely common factor in these different tests. In our initial submission, we had presented the (absence of) response of PINOID as such a negative control, to show that induction by stress is indeed specific to STM. Yet, we agree with the reviewer that a single gene, and not even a transcription factor, is too weak to fully support our claim. In this revision, we present the response to mechanical perturbations for two new boundary-expressed transcription factors. We decided to focus our efforts on CUC1 and CUC3. Both genes display a boundary specific expression, albeit with minor differences both in their exact spatio-temporal pattern and regulation. We found that CUC1 expression is completely insensitive to ablations, thus confirming that all boundary-expressed transcription factors are not induced by mechanical perturbations. In contrast, we found that CUC3 is always induced after ablation, and we even found that this induction happened earlier than STM. Interestingly, CUC3 has a greater contribution to the separation of cotyledons than CUC1 and CUC2 (Vroemen et al., 2003 Plant Cell) and it displays a slightly different spatio-temporal expression pattern that of CUC1 and CUC2. CUC3 is also not regulated by miRNA164. We thus thank the reviewer for this suggestion, as our manuscript is now strengthened with the example of two boundary-expressed genes from the same family, one being induced by mechanical perturbation while the other is not. 3) Please also carefully address some technical issues. It would be especially important to demonstrate that your assumption that the amiRNA construct preferentially downregulates STM in the boundary region is true. Combination of this construct with a STM protein fusion reporter could substantiate this claim.This is indeed a good point and we have performed the required experiment. We had introgressed the pSTM::STM-Venus marker in the pSTM::STMamiRNA lines beforehand and in this revision, we provide the corresponding images: we can indeed detect a down regulation of STM-Venus signal in the pSTM::STMamiRNA lines, albeit at various levels, depending on the lines. In these lines, the pSTM::STM-Venus signal becomes more homogeneous, consistent with a down‐regulation of STM expression at the boundary (as seen on top and side views in Figure 3). Following the suggestion by the reviewers, we also further characterized the stm-dgh6 pSTM::STM-Venus line in much more details. We now show the late phenotype of stm-dgh6 plants in which vegetative growth can be observed. More importantly, we demonstrate that full complementation occurs in homozygous stm-dgh6 lines when the pSTM::STM-Venus construct is also homozygote. We apologize for the confusion in the initial submission and thank again the reviewers for raising these issues; we believe that these extra data strongly support our initial claim. Reviewer #1:[…] In summary, curvature and STM reporter expression are correlated in the shoot apical meristem. However, the experiments in this paper do not satisfactorily solve the question of causation. Because KNOX genes can cause alterations in curvature in otherwise smooth surfaces (e.g. Tsiantis lab work in Cardamine leaf; Long and Barton, 1998, Development, for work in the Arabidopsis embryo), the simplest explanation seems to be that STM causes the alterations in curvature by inhibiting cell division and/or cell expansion at the boundary. A mechanism for this is suggested by findings by the Hake lab showing that KNOX targets include genes involved in auxin transport as well as genes involved in cell wall synthesis. We agree with the reviewer: this is indeed the simplest explanation and we had already briefly mentioned it in our initial submission. To support it more strongly, we have included the suggested references with the corresponding text and stated that STM may very well cause the alteration in curvature, without a mechanical feedback from curvature onto STM expression. Here we rather view the high degree of correlation between STM expression and curvature as a necessary condition for the existence of a feedback from shape onto STM expression. In other words, we certainly do not deny the simplest scenario, we instead investigate whether a strong correlation can reflect the presence of additional cues, such as auxin depletion or mechanical stress, that would reinforce the role of STM in shaping the boundary, by channeling its expression. As for the experiments showing that mechanical stress induces STM expression, it is possible that many types of wounding or perturbations to the shoot apical meristem will cause an indirect increase in STM reporter expression as the plant attempts to compensate for the insult. The authors should test additional stresses to see if this is a more general phenomenon. As detailed above, we now clarify the definition of mechanical stress perception (continous vs. discontinuous) and we show that jasmonic acid, a known product of wounding, does not induce STM expression in the meristem. We also want to underline that in addition to ablations and compressions, we also observed an induction of STM expression after isoxaben treatment, which corresponds to a very different way to increase tension in cell walls. The authors should also extend the analysis to other "meristem genes" expressed especially in the boundary zone – CUCs, BOPs, JLO – to determine if this is specific to STM. As discussed above, we now show that CUC1 expression is not induced after ablations, while CUC3 expression is. This represents a major addition to the initial submission, as this demonstrates that in the boundary, transcription factors, even from the same family, can be clearly discriminated according to their ability to respond to mechanical stress. The core message of this very interesting manuscript is that mechanical stress activates the expression of STM, a homeodomain transcription factor with key roles in maintaining meristem fate at the boundary of meristem and organ primordial and that STM is required for boundary formation and organ separation. The finding that an important developmental regulator is under control of physical forces in the growing organism while at the same time acting on shaping the organism is certainly of relevance to a wide audience. The experiments (mostly live cell imaging of fluorescent reporters, coupled to perturbations) and analyses shown are of high quality and are mostly well presented. However, in the present form the manuscript has several important shortcomings, which need to be addressed, but based on the exciting findings, I think it is a strong candidate for publication in eLife after revision.1) The authors exclusively use a fluorescent reporter as proxy for STM activity, however, it does not faithfully recapitulate endogenous STM expression. The differences need to be addressed, preferably by in situ hybridization of reporter plants using STM and CFP probes. I think this experiment is essential validate the major claims concerning the responsiveness of STM expression to mechanical stimuli. In this revision, we provide in situ hybridization of STM after ablations, and in which we can detect a stronger STM signal around the ablation site, thus confirming the results obtained in our two fluorescent STM marker lines. Note however, that we cannot obtain dynamic behavior and thus the induction level cannot be quantified; only the correlation between the spatial pattern of induction and the position of the ablation is relevant. Furthermore, we now provide evidence that the pSTM::STM-Venus line can fully complement the stm-dgh6 strong allele, confirming that the higher STM promoter activity at the boundary that we see in our STM marker lines is biologically relevant. Last, the analysis of other boundary-expressed genes such as PID and CUC1, which do not respond to mechanical perturbations, also further strengthen the results obtained in STM, by demonstrating specificity. Along these lines, I would also like to see that endogenous STM expression responds to a selected experimental stimulus, such as pinching. Again, these experiments could be done in the reporter line, comparing STM and CFP expression by qRT-PCR. These experiments would unequivocally demonstrate that the observed CFP induction is not an artifact of the reporter. As discussed in the main text above, pinching does not induce STM expression in our hands. We believe that the response of STM to ablation, compression or isoxaben treatment rather reflect a response of STM to continuous, intrinsic, growth-related stress. STM being such an essential gene, it is likely that its expression should be relatively insensitive to stochastic cues and should instead be channeled to ensure reproducibility. In this scenario, pinching would be filtered out in normal conditions, while growth patterns may be used to channel STM expression. In this revision, we have clarified the type of mechanical stress we are dealing with in the main text, notably by comparing the STM response in the SAM to that of cortical microtubules. In both cases, a steady response (STM promoter increased activity, MT hyperalignment) is caused by intrinsic continuous stresses, and not by touch. The absence of STM induction after jasmonate exposure further supports this conclusion. We fully agree with the reviewer and acknowledge that our initial analysis was too superficial. As detailed above, we have improved the presentation of the results with more pictures and close‐ups, together with genotyping protocols. The STM amiRNA lines exhibit small meristems and organ fusions, consistent with a primary role of the boundary in organ separation. In this revision, we also measured curvature in the STM amiRNA lines. We found that curvature did not scale to meristem size and that the smaller size of the meristem also brought adjacent boundaries close to one another. These two factors might explain the presence of fusions in the STM amiRNA lines. Same here: this was indeed a missing piece in our initial submission and we have corrected it by providing images of pSTM::STM-Venus expression in the amiRNA lines. STM is indeed downregulated at the boundary in these lines. This was indeed unclear in our initial submission. The earliest induction for STM is 8 hours based on the compression experiments. We have not conducted extensive kinetics analysis to check when on average STM is induced after mechanical perturbations, but we never saw an induction before 8 hours so far. This has been clarified in this revision. We now provide STM in situ hybridizations after ablation and we also demonstrate that pSTM::STM-Venus fully rescues the stm mutant, so it is very likely that our claim is also valid for STM expression. Yet, we agree with the reviewer and we have clarified this point in this revision. 6) The claim that STM reporter expression is much higher after removal of NPA is not substantiated by the data shown in Figure 1–—figure supplement 1. Here we meant that after removal of NPA, STM reporter expression switches from being relatively homogeneous in the SAM to being high in a new boundary (as the absence of NPA triggers organogenesis), mimicking the pattern observed in dissected meristems expressing the pSTM::CFP construct in absence of NPA. We thank the reviewer for this positive feedback. These are creative attempts to specifically alter STM expression in the boundary region; however, no evidence is presented to actually confirm that such preferential alteration has actually occurred. It would have been informative to show the expression pattern of pSTM::STM-Venus not only in a WT background (Figure 3A) but in the dgh6 mutant line, as the expression pattern of the weakly expressing WT parent line (Heisler et al. 2005a) may not necessarily have been maintained after crossing. As detailed above, the suggested experiment is now included in this revision and confirms that complementation is associated with STM‐Venus expression in homozygous stm-dgh6 lines. As shown in the initial submission, we find that the STM amiRNA lines exhibit small meristems and organ fusions, but no meristem termination, consistent with a primary role of the boundary in organ separation. In this revision, we measured curvature in the STM amiRNA lines. We found that curvature did not scale to meristem size and that the smaller size of the meristem also brought adjacent boundaries close to one another. These two factors might explain the presence of fusions in the STM amiRNA lines. Similarly, it would be useful to know whether STM expression is preferentially silenced in the boundary in pSTM::STMamiRNA2 lines. Transformation of the constructs into pSTM::STM-Venus lines would have been informative. If these experiments are not done, the limitations should at least be discussed. As detailed above, we have introgressed pSTM::STM‐Venus in the pSTM::STMamiRNA2 lines and found a down‐regulation of Venus signal in boundaries, when compared to WT plants. We could not detect a major impact of the treatment on the overall shape of the meristem. 2,4‐D is likely to impact growth rate as a whole, but it is unclear whether this would also increase differential growth. The independence with auxin is unequivocally shown in Figure 7G, in which STM expression can be induced in a pin1 background, in which no induction of the DII sensor can be detected. We have not measured the relation between curvature and STM expression after mechanical perturbation, notably because we would need to include a membrane marker (like FM4-64) that may interfere with the response. We prefer to keep the mechanical perturbations as simple as possible to avoid multiple controls. Yet, we analyzed the correlation between curvature and STM expression in the katanin mutant, which displays a delay in tissue folding, and found that the correlation between tissue folding and STM expression was maintained. We believe that this experiment addresses at least partly the suggestion from reviewer 3. Thank you for this feedback – we have rephrased our conclusions accordingly in this revision. Please also clarify the following: there are some doubts whether the experiments show jasmonate insensitivity of STM expression as stated in the text. In the supplemental figure, there is clear STM expression increase that does not occur in any of the mock treated samples. It thus appears simply wrong to say it is insensitive, and these results should not be "hidden" in the supporting information. We also have moved the jasmonate results in the main figure. This paper presents several interesting observations. My problem with the paper – even after the changes and in some cases even more so after the authors' additions – is that the authors shoehorn their observations into a model in which mechanical stress increases STM expression.In the body of the paper, the authors include alternative explanations for the correlation such as in this paragraph:"The fact that STM expression correlates with curvature at the boundary can simply be explained by the fact that STM reduces the growth rate at the boundary, leading to tissue folding. KNOX genes can cause alterations in curvature in otherwise smooth surface (Long and Barton, 1998, Barkoulas et al., 2008). The impact of STM on crease formation at the boundary could be mediated by inhibiting cell growth in this domain. Consistent with this scenario, KNOX target genes include genes involved in auxin transport as well as genes involved in cell wall synthesis (Bolduc et al., 2012). However the strong correlation between STM promoter activity and tissue folding suggests that a signal, which is related to curvature, could add robustness to the STM expression pattern at the boundary. "Why would a strong correlation lead one to prefer one direction of causality over the other? In the quoted text, we state that hypothesis 1: “STM slows down growth and this induces folding” is actually a fact. We are therefore not preferring one direction or the other, we say that direction 1 “STM -> shape” exists for sure. We are exploring whether the other direction “shape-> STM” also exists. In other words, what we are looking for is whether the correlation between folding and STM expression also reflects the presence of a feedback. This does not mean that a feedback exists, we only say that the existence of a correlation is a necessary condition for the feedback to exist. Therefore we need to quantify curvature and relate it to STM expression to check whether the correlation is strong or not, before moving on to auxin and mechanics as potential feedback factors. If we had found a very weak correlation between STM expression and curvature, then STM would not have been on our candidate list for a target of shape feedback. We know that STM/KNOX expression exists in the absence of tissue folding and also precedes tissue folding in the embryo, and precedes tissue folding in the development of leaf lobing. To my knowledge, there is no case of tissue folding that precedes STM/KNOX expression. We observed and measured that STM promoter activity increases with tissue folding, but it is very likely that STM induction indeed precedes tissue folding (although this would be more difficult to quantify, as this would involve measuring regional differential growth – see below). In fact, when comparing STM expression at the boundary with the microtubule response to mechanical stress in the same domain, we also see that microtubule align in the boundary before folding occurs, and this alignment can be correlated with differential growth (and thus directional stress) at the boundary before folding: the fast growing initium is generating stress before it forms a crease at the boundary (see e.g. Burian et al., 2013 J. Exp Bot). Here we only focus on curvature because the formation of a crease reflects the presence of stress at the boundary for sure, while a flat shape may or may not be related with stress (differential growth then also needs to be measured). The induction of STM/KNOX in leaves and embryo before folding may very well be related to differential growth (and thus stress) preceding folding. We have added this point in the new Discussion. Of all the treatments that the authors subject the plants to, pinching would seem to best simulate folding but pinching the meristem does not increase STM expression. This argues strongly for the arrow of causation to be in the direction counter to what the authors propose. (The authors make arguments about how pinching is somehow different than the stresses that would normally be sensed by STM but I am not convinced). We don’t think that the pinching experiment reflects what happens at the boundary: in this domain, mechanical stress is predicted to slowly increase and to become more and more directional as the tissue folds. This is quite different from a transient compression from the top of the tissue. In fact, the ablations, lateral compressions and isoxaben treatments that are included in our manuscript are more consistent with the situation at the boundary: a prolonged exposure to mechanical stress. This discussion comes down to signal transduction kinetics: if one could increase very transiently auxin concentration (for a fraction of a second), the TIR1 auxin pathway would probably not be induced significantly enough to have a visible, steady, impact on gene expression. But this may be sufficient to induce visible short term responses, like a calcium peak. In other words, the cell responds differentially to transient and prolonged cues. Similarly, cellulose synthesis occurs in response to prolonged exposure to mechanical stress (caused by progressive wall thinning/weakening). To our knowledge, one pinching event does not induce a permanent increase of cellulose synthesis; only the repetition of such deformations (like the wind) may have a significant impact on growth. Last, in the text we refer to other documented genes that are downstream targets of mechanical stress. While some of them (TOUCH genes) are clearly induced within minutes of mechanical deformation, others (e.g. ELA1 in the immature seed (Creff et al., 2014 Nat. Com)) take several hours to be induced after prolonged exposure to stress, like STM in our experiments. Whatever the reality may be, in this paper alternative interpretations are downplayed. There is no mention of alternative models in the Discussion and the title is overly strong in its assertion given the weak, and by the authors' own admission, indirect, connection between physical stress and STM expression.To clarify again: the fact that STM slows down growth and induce folding is not an alternative hypothesis, it is a fact. Here, based on the strong correlation between folding and STM expression, we explore whether signals may in turn enhance STM expression at the boundary. We explore two signals: auxin and mechanical stress. Other signals could be checked (the list is very long and beyond the scope of this article); this is where alternative hypotheses could be found. We find that if auxin depletion and mechanical stress both correlate with STM induction at the boundary, they are not coupled: mechanical induction of STM is most likely not mediated via auxin depletion or jasmonate induction. We have added two paragraphs in the Discussion to explore other scenarios (please see: “Alternative cues may be involved in the promotion of STM expression […] these may be better candidates for the regulation of STM expression at the boundary”) and carefully rephrased our conclusions and title to avoid any misunderstanding. What is missing for sure is a mutant that would be mechano-insensitive and in which STM expression pattern at the boundary would be less robust. We are working on it currently and we hope to provide more conclusive results in the future. Yet, at this point, we believe that this work is a solid analysis of the relation between shape and STM expression in the meristem, from which we find that mechanical stress contributes to STM expression, in parallel to auxin depletion. We also provide a number of open prospects in the Results and Discussion that should stimulate further research. We have collected seeds from double homozygote thus confirming full complementation. 2) The authors have added a test for response of STM expression to jasmonate, a hormone associated with wounding stress. This is an experiment to determine whether the response of STM expression to ablation might be in response to wounding. The data are given in the supplemental section (Figure 5–figure supplement 3). Most plants do not respond – however a significant fraction, 4 out of the 20 or so plants tested, did show an increase in STM expression in response to jasmonate. The authors dismiss this positive result as unimportant but I am not sure what the basis for their dismissal is. (I can easily envision an entirely different historical scenario for these experiments that would lead to a different set of conclusions: A set of jasmonate researchers could have reasonably concluded that applied jasmonate can increase STM expression. They would then have followed up that observation with ablation experiments on the meristem finding that STM expression increased in response to wounding. )In short, the jasmonate experiments indicate that the situation is likely to be complex. Rather than sweeping this complexity under the rug, the authors should discuss it. The situation is complex and in this case there is an interesting perspective to follow: CUC1 expression is regulated by miR164 whereas CUC3 is not. This suggests that different mechanisms ensure the robustness in expression for members of the same gene family. For this article, the goal was rather to show that only a fraction of boundary-expressed genes are regulated by mechanical perturbations. This is the only conclusion we draw from these extra results. In these experiments, meristems are recovering from NPA treatments so this would be unlikely, but not impossible. Yet, since controls and assays are conducted in the exact same conditions throughout, the conclusions still stand. Note that STM induction was also observed in the complete absence of NPA in a pin1 mutant (Figure 7G) and in the continuous presence of NPA (Figure 7–figure supplement 3), so at least STM induction by mechanical perturbations does not seem to be NPA dependent. I am very happy with the thorough revision of the manuscript and the addition of many meaningful and well-executed new experiments. I now support publication of the manuscript without hesitation. We also have increased the number of replicates for the ablations on the CUC1 marker line (all negative for induction as previously shown). This work was supported by Agence Nationale de la Recherche ANR-10-BLAN-1516 and ANR-10-BLAN-1614, by the European Research Council ERC grant 615739 'MechanoDevo' and ERC grant 294397 'Morphodynamics'. We thank Henrik Jönsson, James Locke and Elliot Meyerowitz for allowing B.L. to carry some experiments while working on a new project at the Sainsbury laboratory. We thank Frédéric Bègue for help with the initial compression experiments on pBOUND>>GFP and Isabelle Bohn-Courseau for contributing to the generation of the pPID>>GFP line; Véronique Boltz for help with molecular biology; Weibing Yang for help with in situ hybridization; Fabrice Besnard, Marina Oliva, Géraldine Brunoud and Magalie Uyttewaal for providing unpublished material and for advice. We also thank Platim (UMS 3444 Biosciences Gerland-Lyon Sud) for help with imaging, the Sainsbury lab in Cambridge for access to a pulsed UV laser system and Centre Blaise Pascal (CBP, ENS de Lyon) for help with computational analysis. © 2015, Landrein et al.